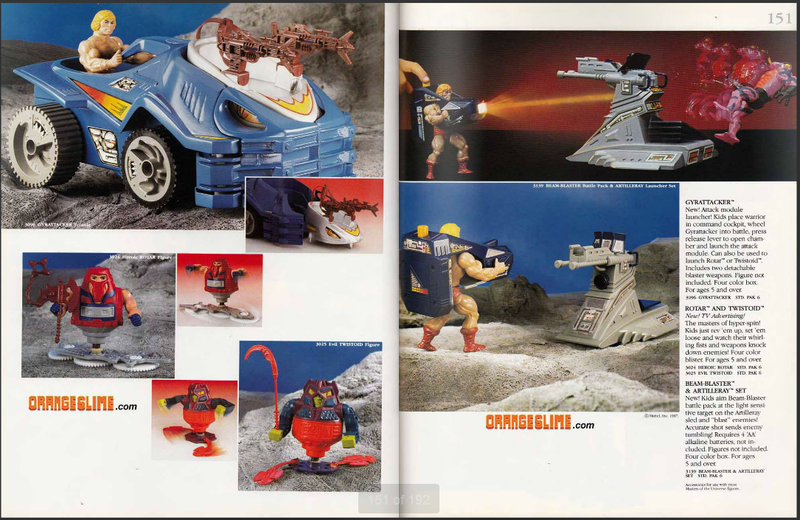 Note: I recently acquired my own copy of this catalog. 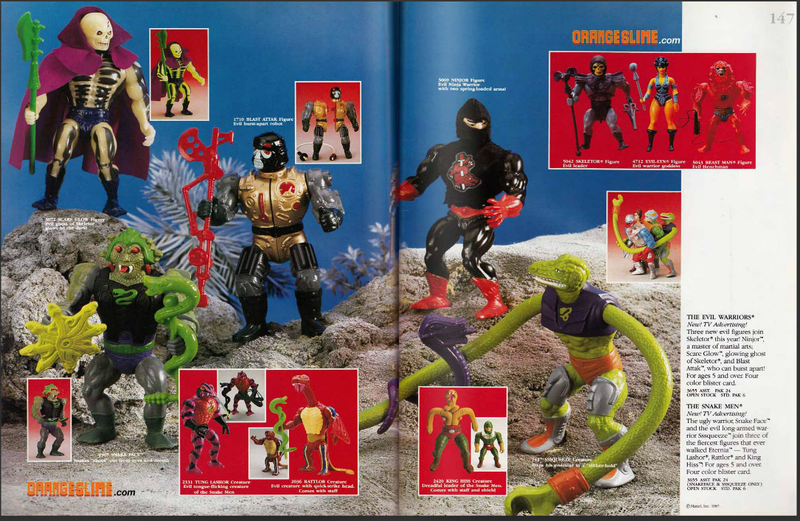 I’ve updated this article with all-new, high resolution scans. Please allow a moment or two for the images to load. 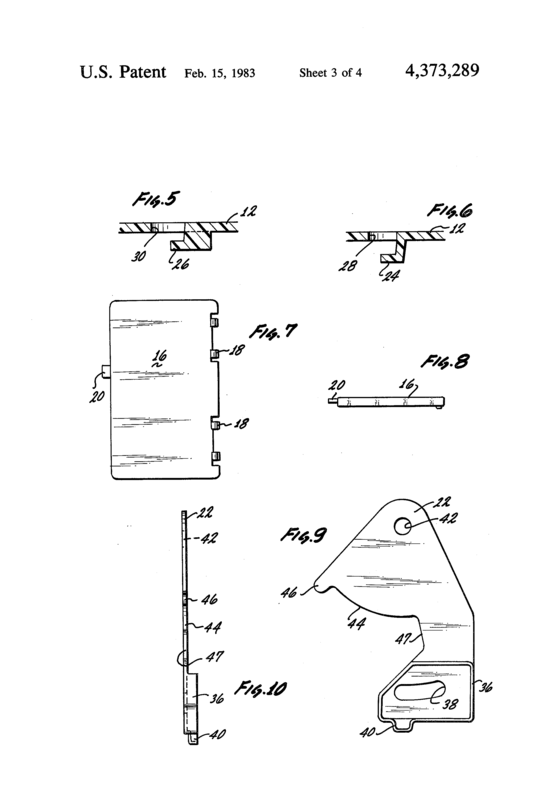 Open images in a new page if you wish to zoom in and see fine details. 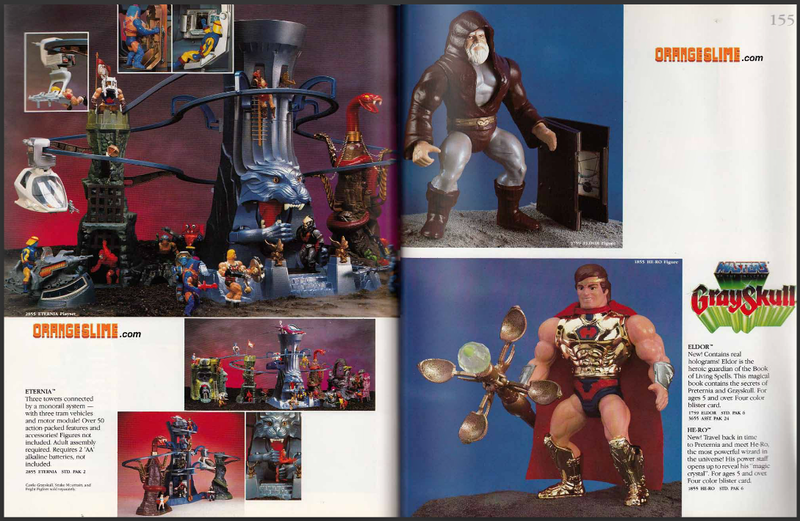 Here is the 1982 Mattel Toys dealer catalog (or at least the portion relevant to the MOTU line). 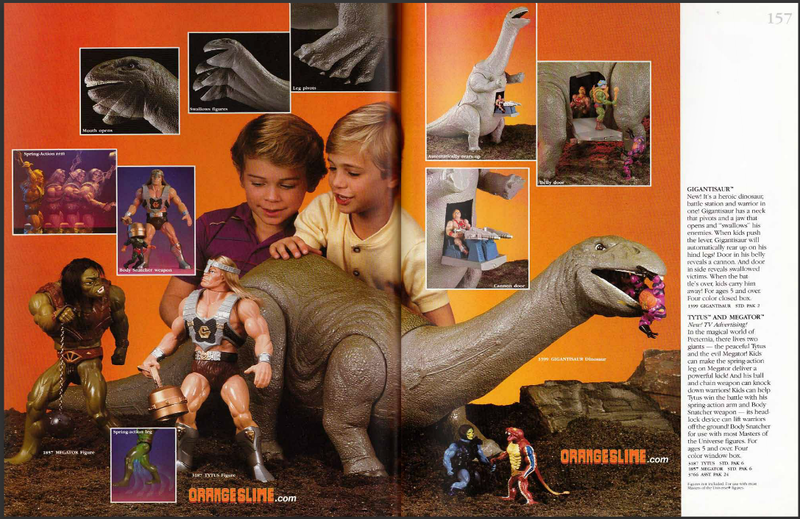 Intended for retailers, the catalog debuted at Toy Fair, February 17, 1982. 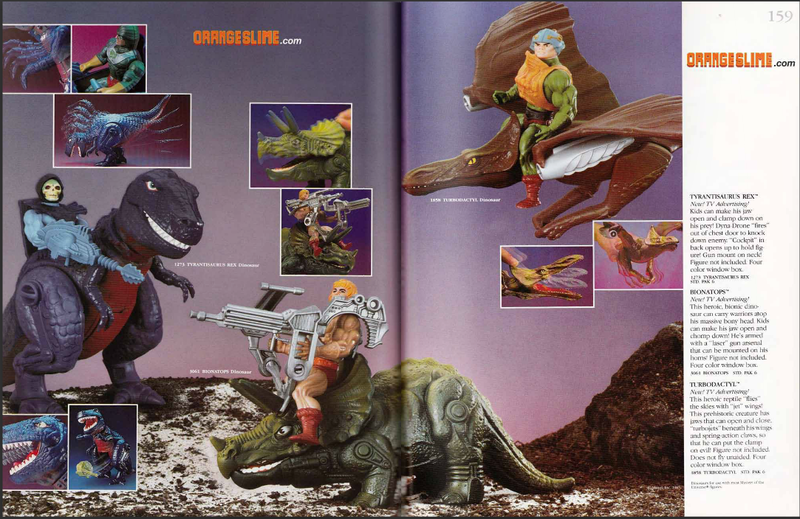 Mattel’s dealer catalogs showcased all the latest and greatest releases, along with existing merchandise. 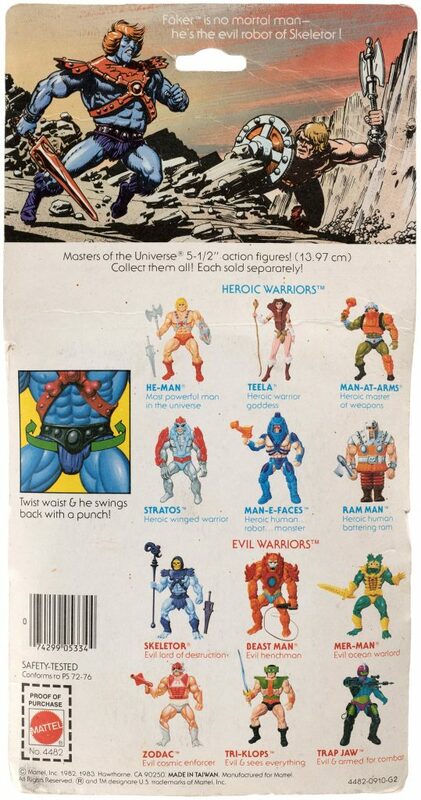 Because the Masters of the Universe line debuted in 1982, this catalog has the smallest amount of space devoted to the line (only three pages) compared to subsequent years. 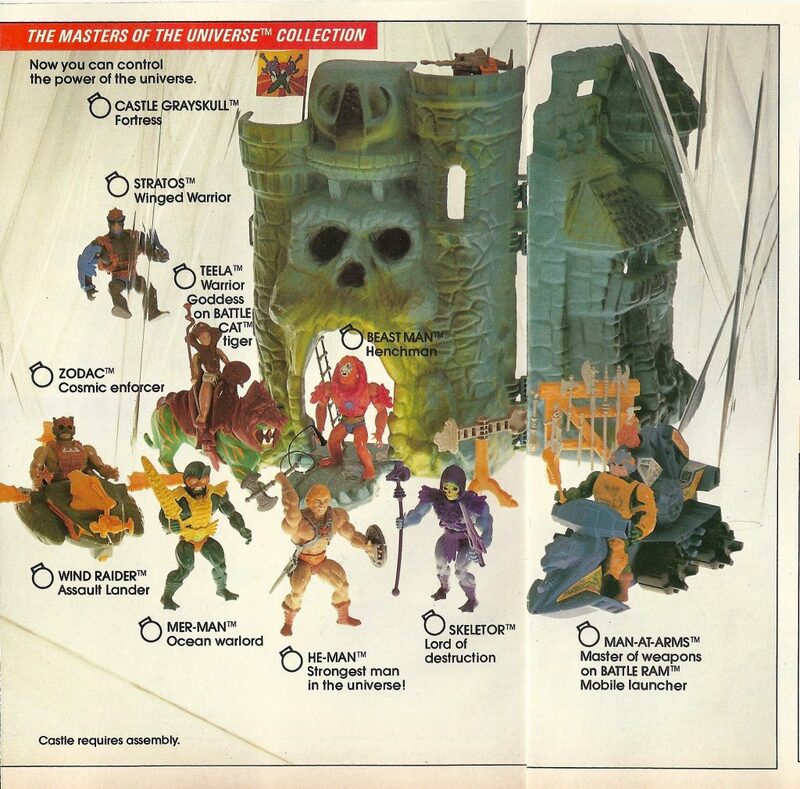 What’s valuable about this particular catalog is that all of the MOTU items are prototypes (albeit late-stage prototypes, with a few exceptions), rather than factory-produced examples. 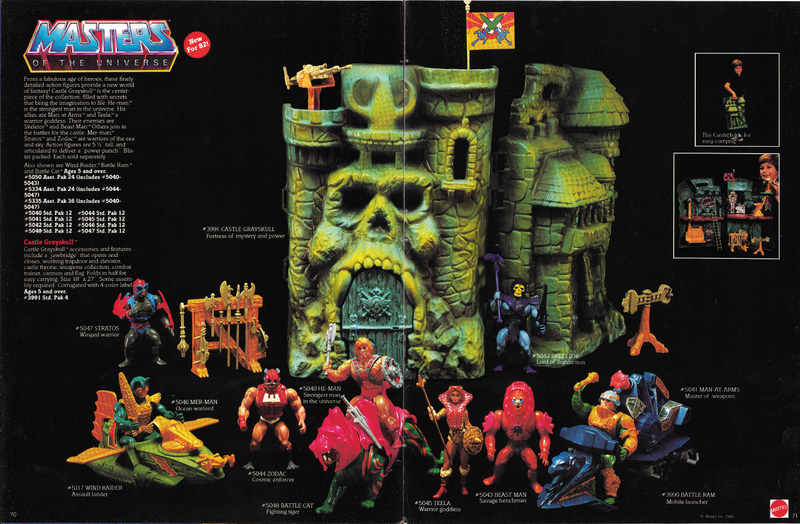 The sculpt on most of these items is the final sculpt, with the exception of Teela, Wind Raider, Zodac’s armor, Castle Grayskull’s jaw bridge (specifically the locking mechanism) and Man-At-Arms’ armor. 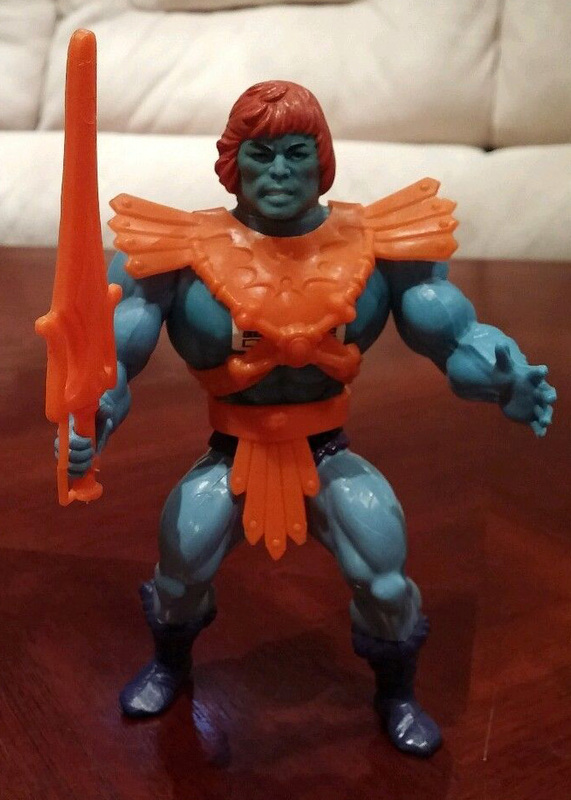 There are earlier prototypes of figures like He-Man and Skeletor that don’t appear here – so these photos represent a snapshot of what had been finalized at a particular point in time, very close to the debut of the line in stores. 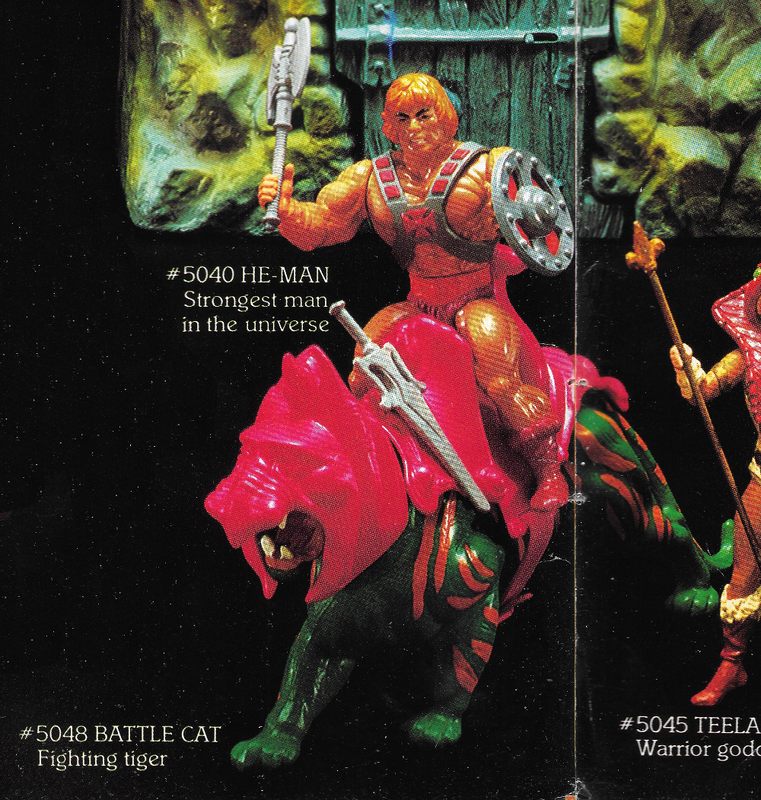 Note that Battle Cat has orange paint around his mouth and a striped tail, which appear to be applied by hand. 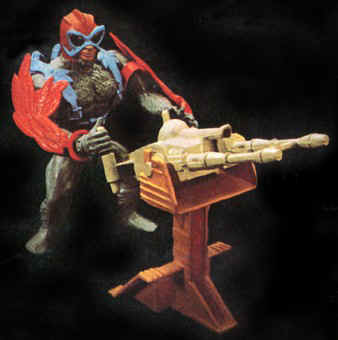 A few pre-production examples with this paint scheme are known to exist, although the production version lacks those details. 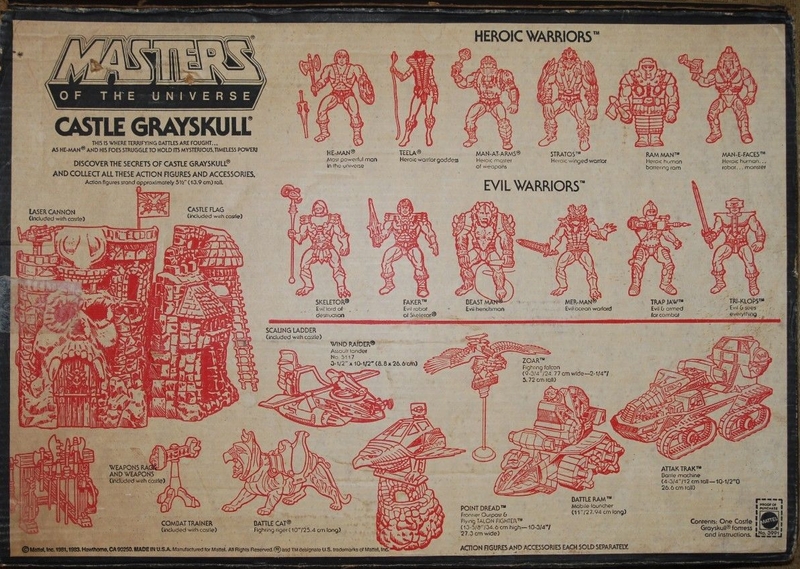 Most of these figures appear to be hand-painted. 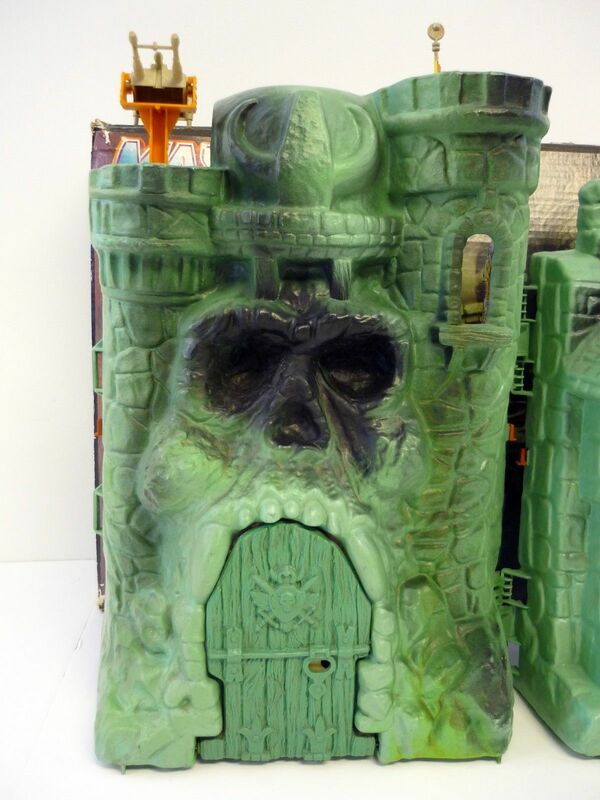 That is most apparent on Castle Grayskull, which has a much finer paint job than any of the production versions I’ve seen. 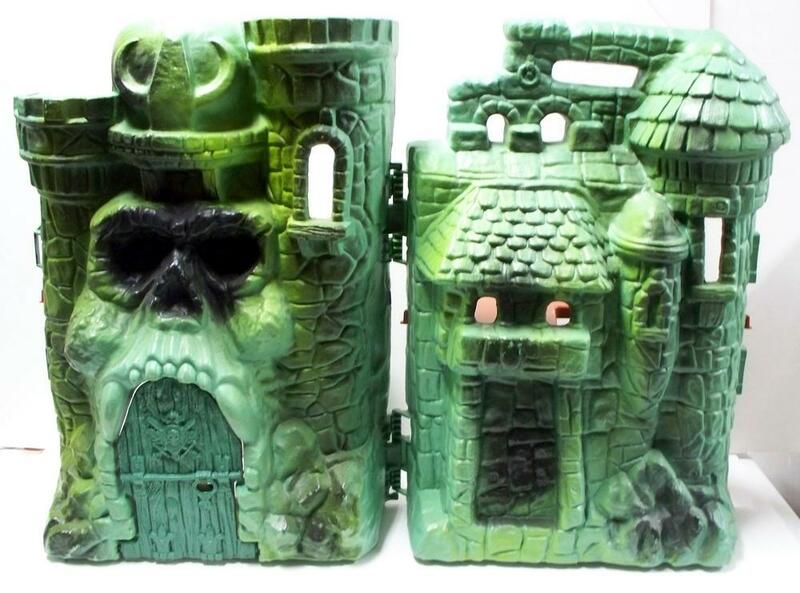 This hand-painted version pops up in product photography several times. 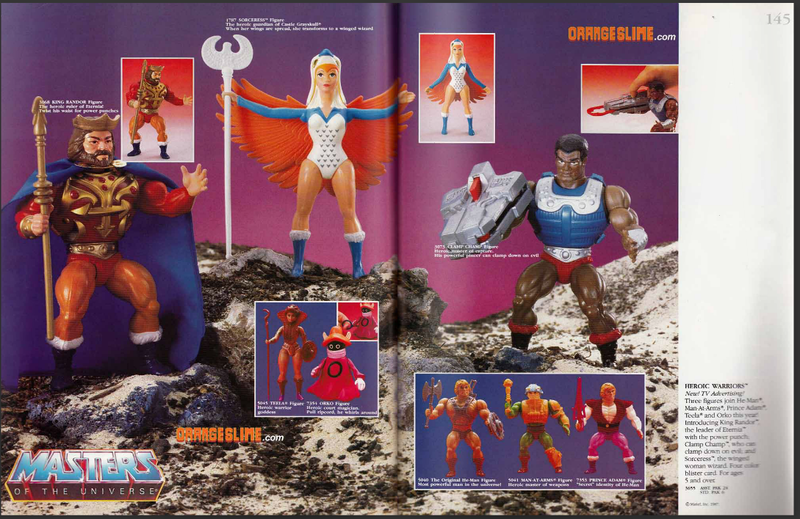 The prototype Teela that appears in this catalog is my absolute favorite version of the character. 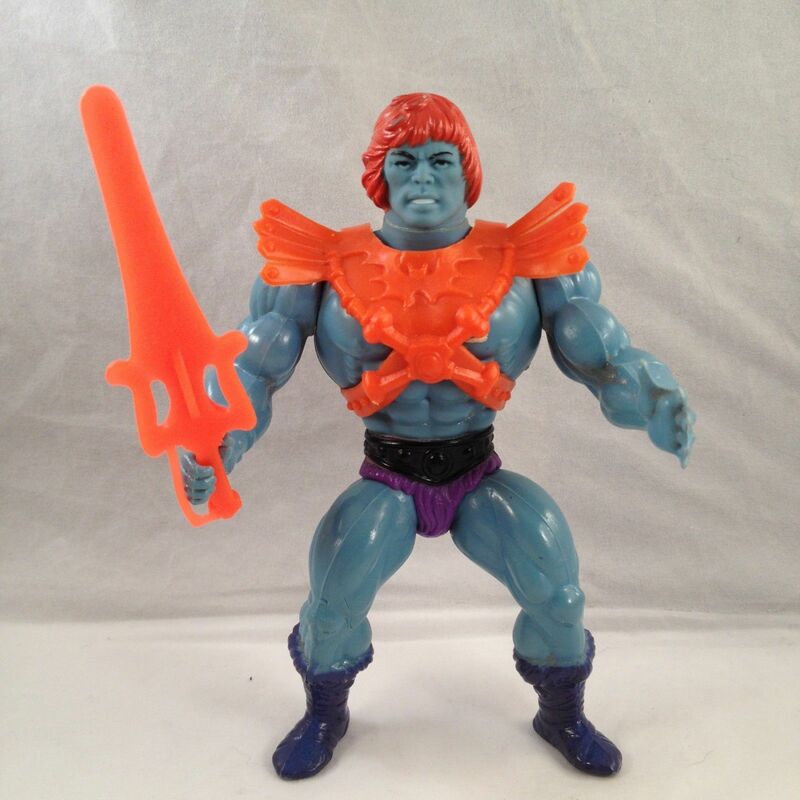 The mass-produced toy didn’t have nearly as much depth. 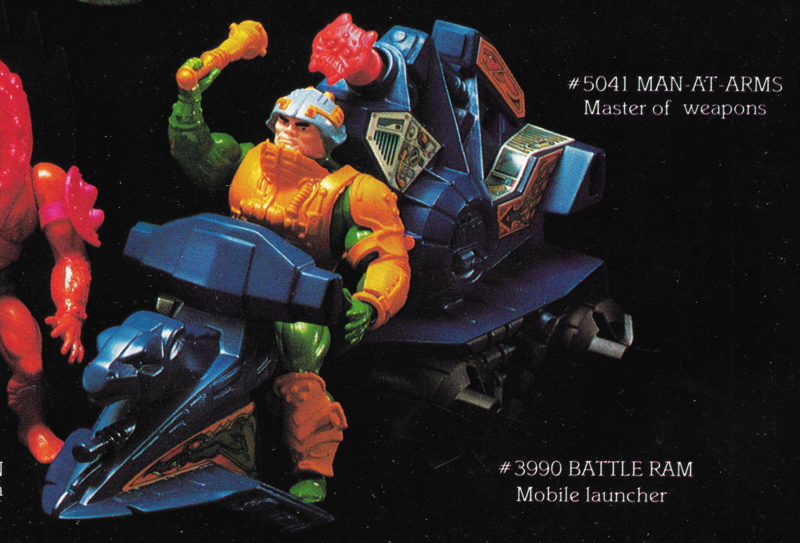 I’m also quite fond of the prototype Wind Raider that appears here, which has a number of key differences from the final toy. 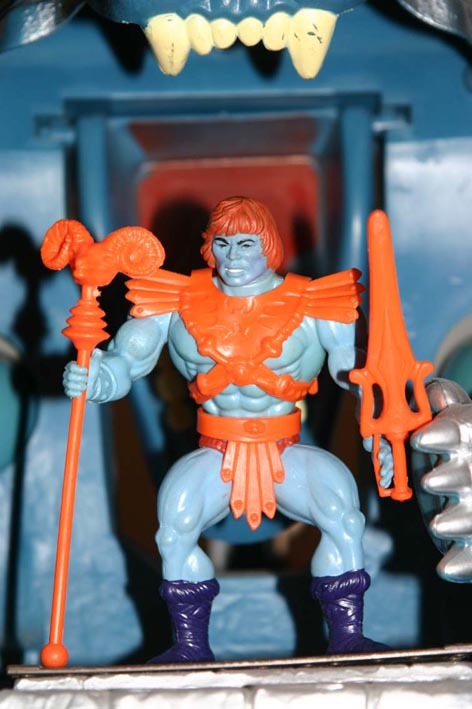 I discuss those in greater detail in the toy features that focus on those toys. 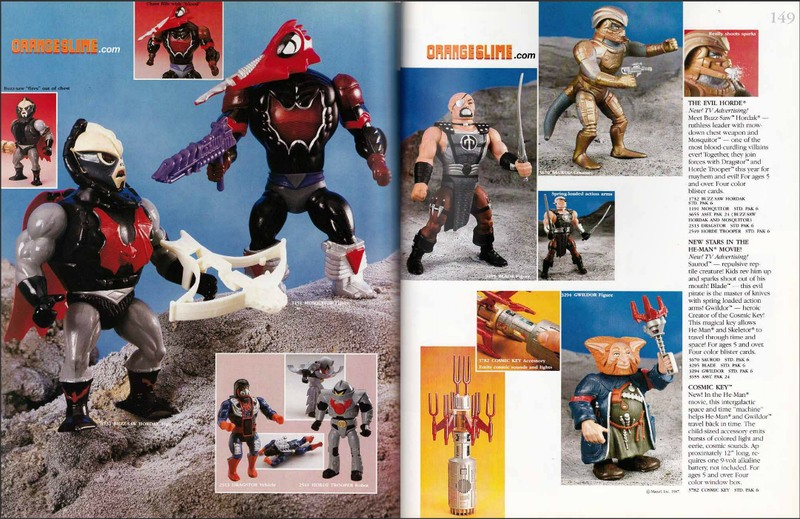 I’ve included shots of all three pages plus closeups of each individual item. 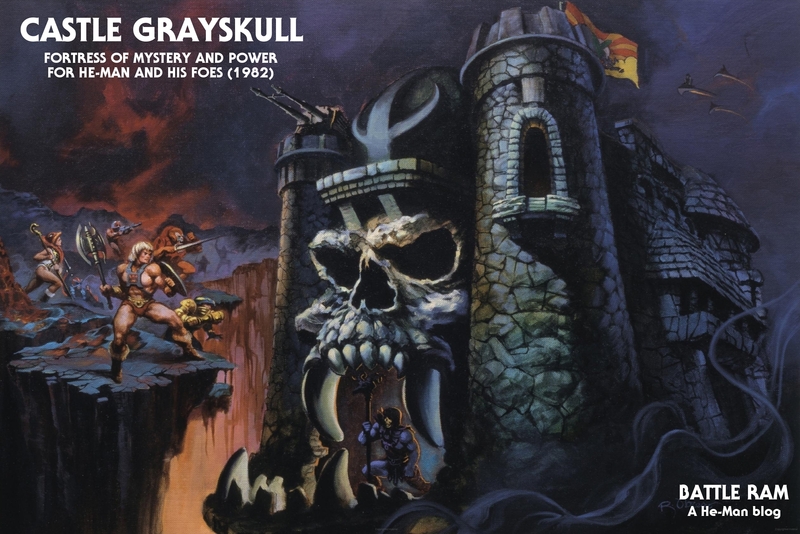 As a side note, the photo spread on the first two pages was used as a basis for the line art that went into the Castle Grayskull instruction booklet. 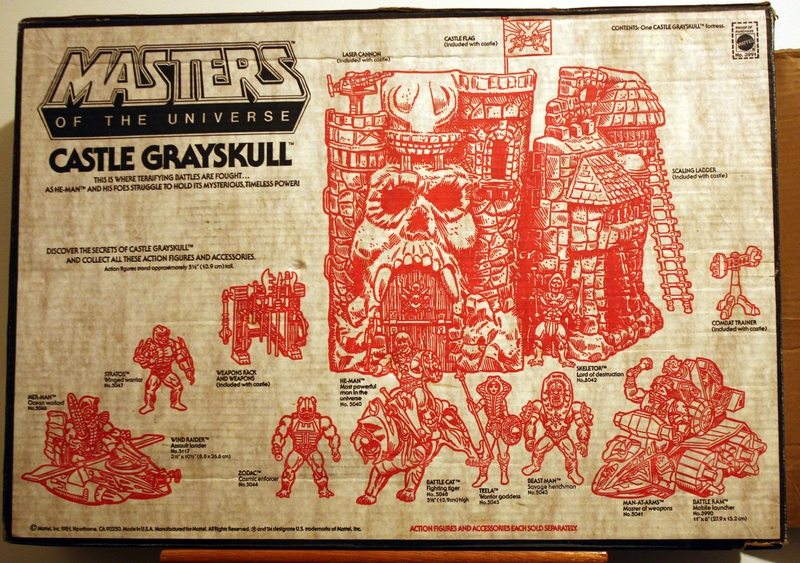 That line art also showed up on the back of the first version of the Castle Grayskull box. 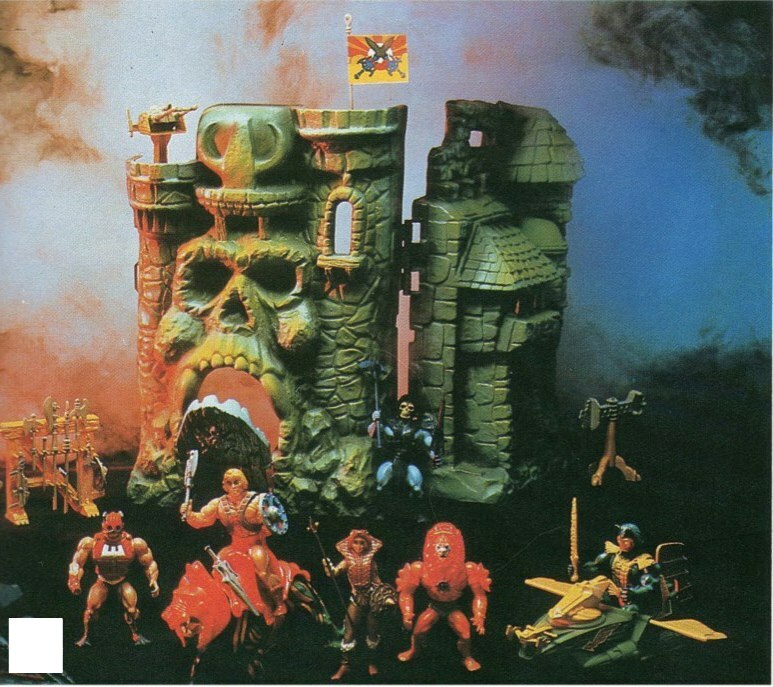 Maybe it’s just my fan bias, but I can’t think of a more iconic playset than Castle Grayskull. To be sure there have been many great ones over the years from Star Wars, G.I. 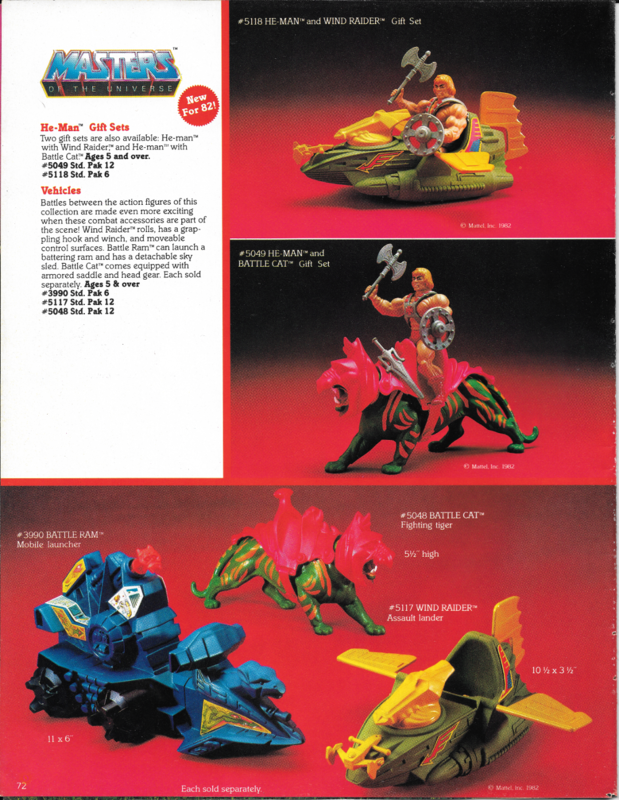 Joe, Ninja Turtles, GoBots and other lines. 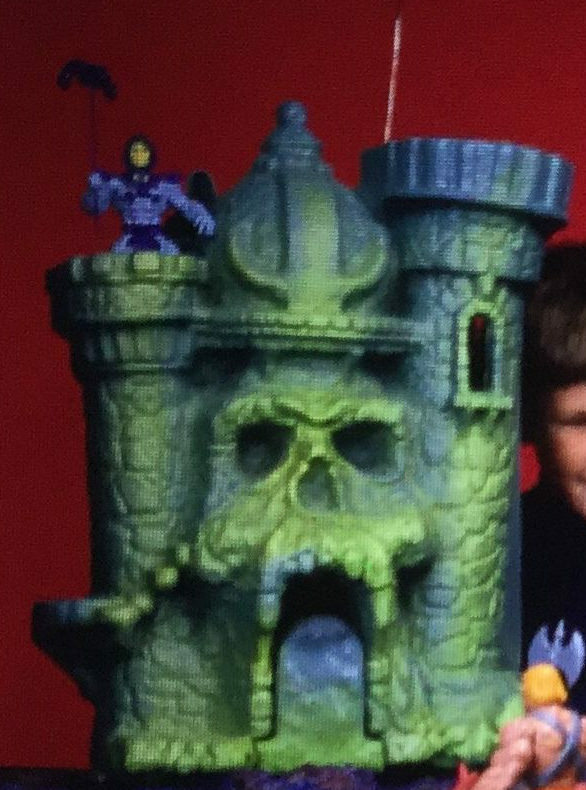 But I can’t think of one that’s as instantly recognizable and universally beloved as Castle Grayskull. But there’s no way I’m ever going to be objective about it, so why even try? 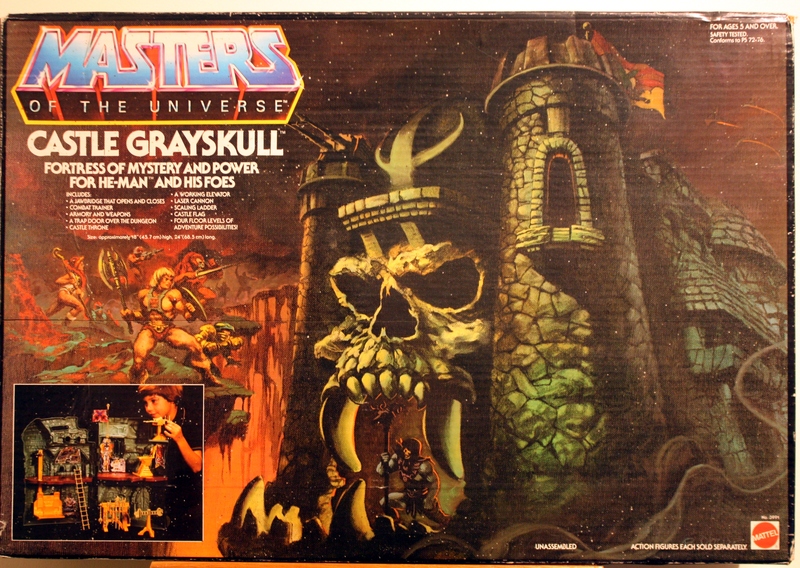 Castle Grayskull was released as the flagship item of the new Masters of the Universe line in 1982. 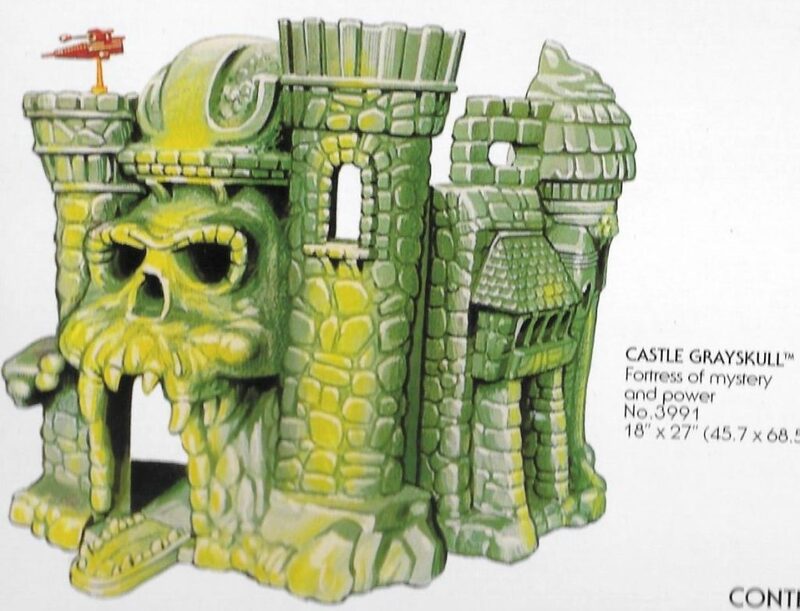 Priced at about $20 ($50 now, accounting for inflation), the castle was marketed as being very much up for grabs by the heroes or the villains. 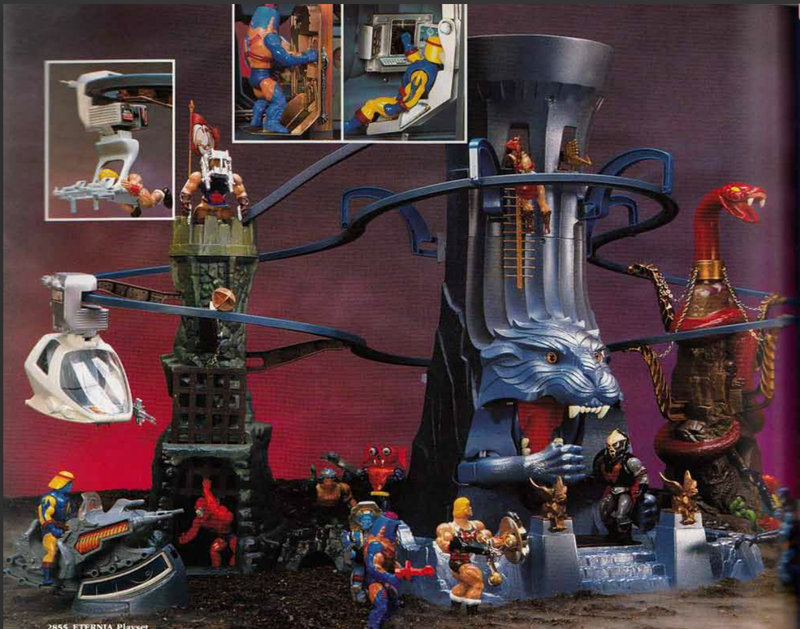 When you’ve got a toy line with only one playset (as was the case in the first year), it helps to have one that can be controlled by either side. 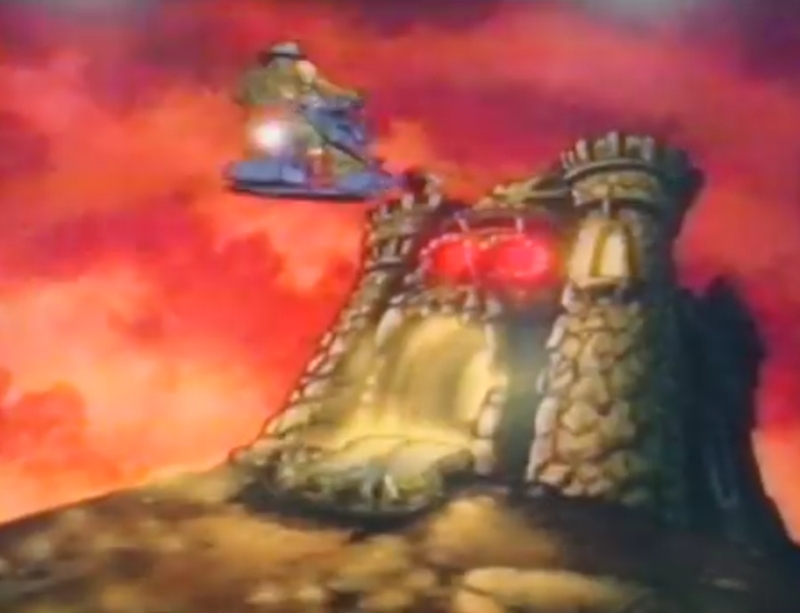 The play pattern was this: the castle could only be entered by combining both halves of the power sword. 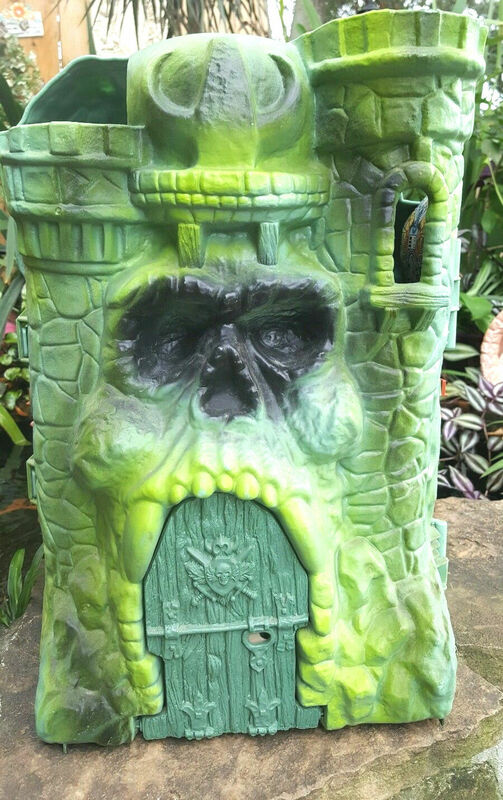 All kinds of traps and perils awaited the unwary inside, but great magical and technological power would belong to whoever controlled the castle. 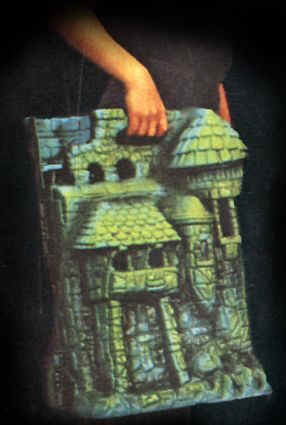 A two-sided flag would indicate which of the forces controlled the castle at any one time. 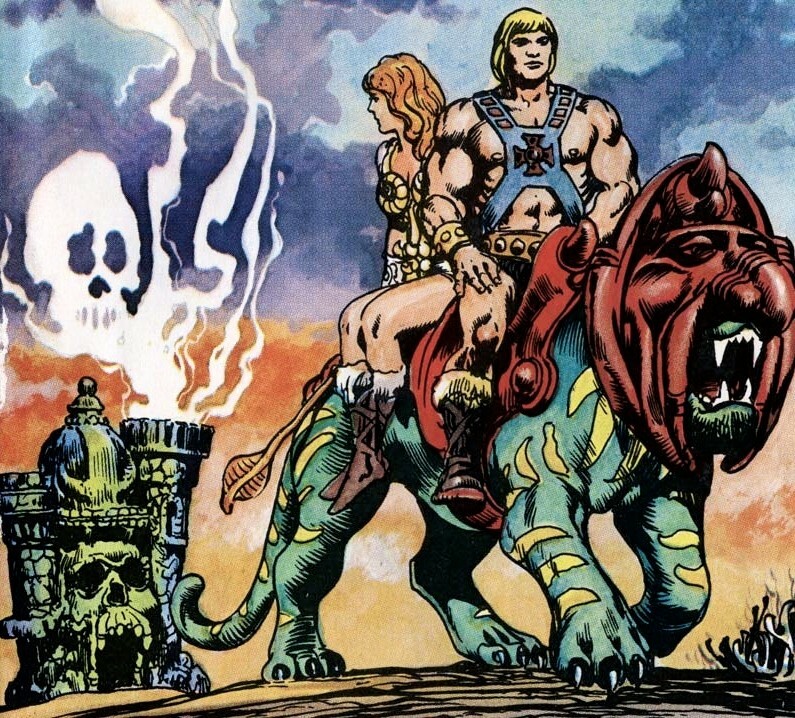 Artwork by Mark Taylor, 1979. 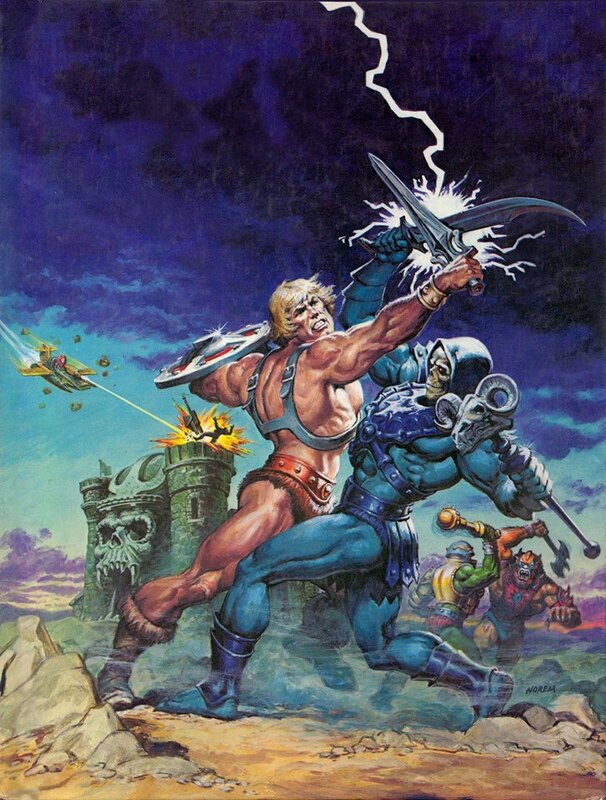 Image source: The Power and the Honor Foundation, via The Art of He-Man. 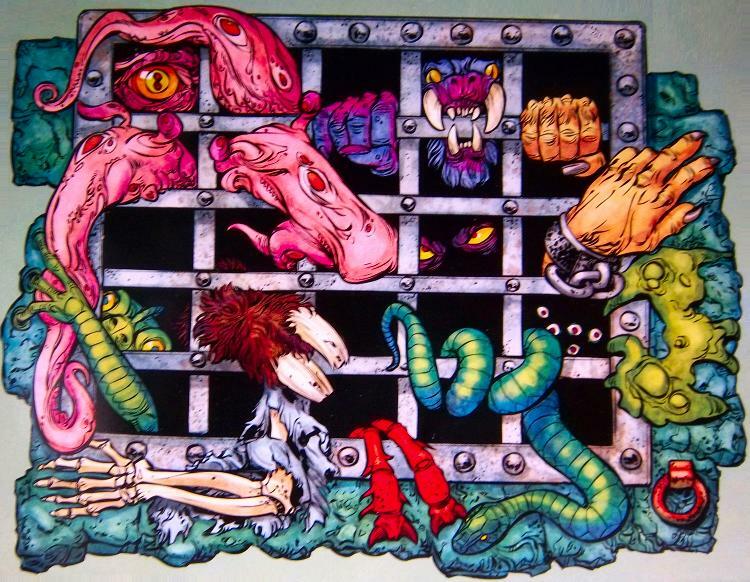 Color version, from Mark Taylor’s “Sketches 1” portfolio. Image courtesy of Doug Feague. 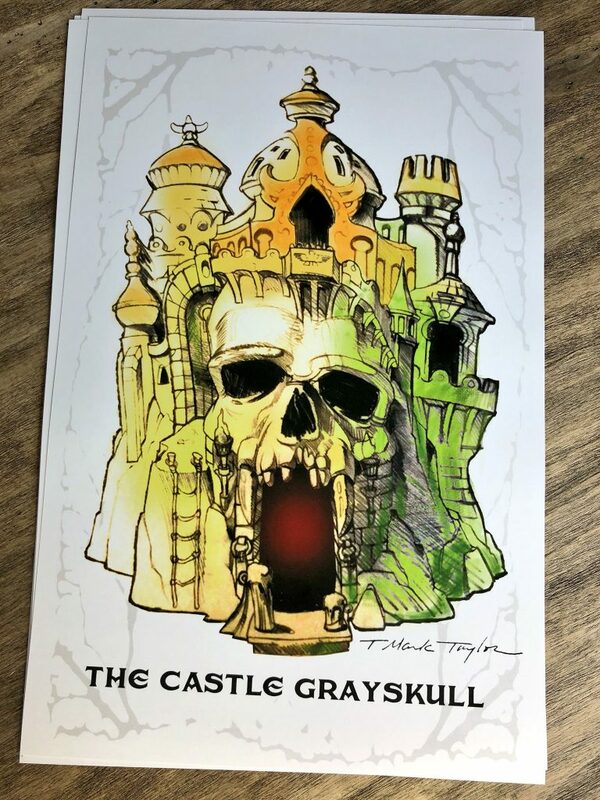 This version of Grayskull looks much more familiar to us than Mark Taylor’s original drawing, but there are still some key differences from the final playset. 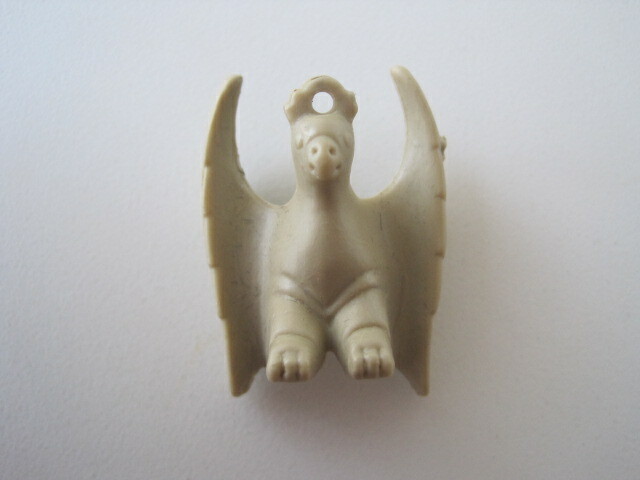 The jaw bridge and mouth opening are pretty small and the teeth look ghoulish and blunt. 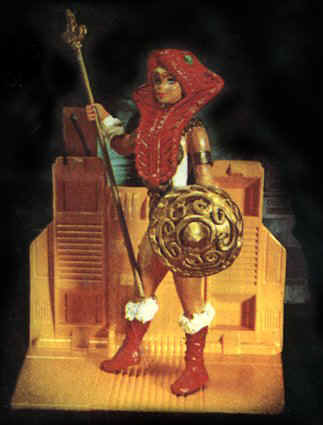 The helmet is tall and rounded and features a pawn-like piece on top. 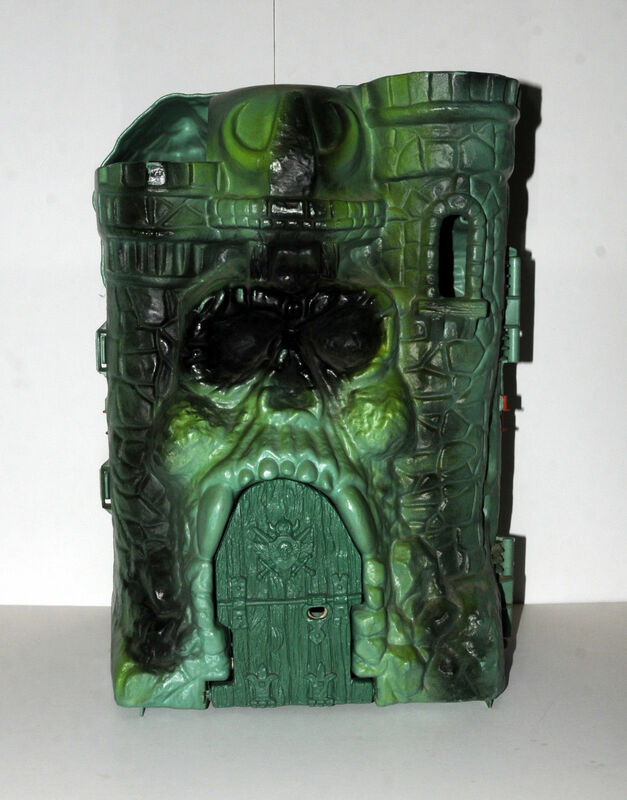 There is no carrying handle on the back side of the playset. 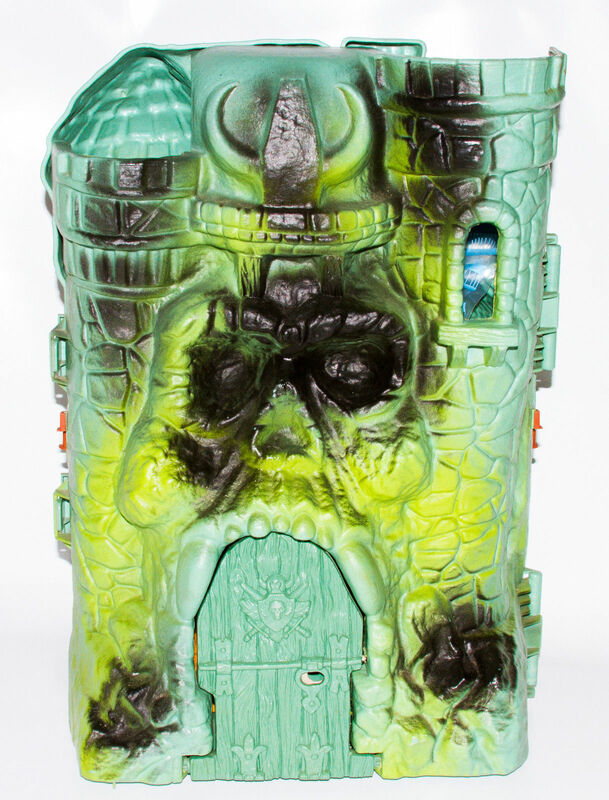 There is also a ledge on the side of the left facing tower for figures to stand on. 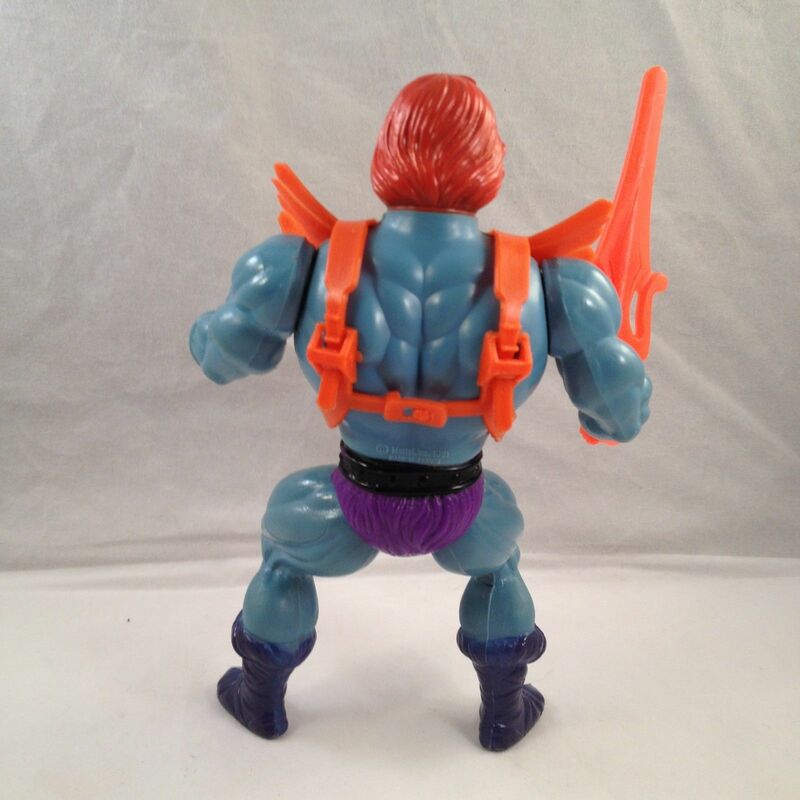 And in general there is a bit more depth to the sculpt than was apparent in the final toy. 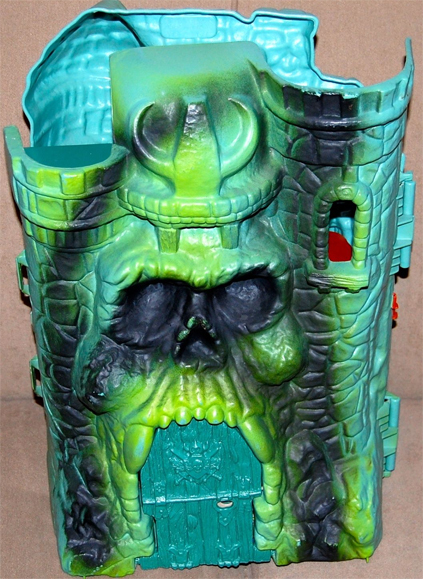 The inside of the prototype was quite different from the final toy as well. The elevator platform was circular rather than rectangular, and the throne looked like it came straight out of a medieval palace. 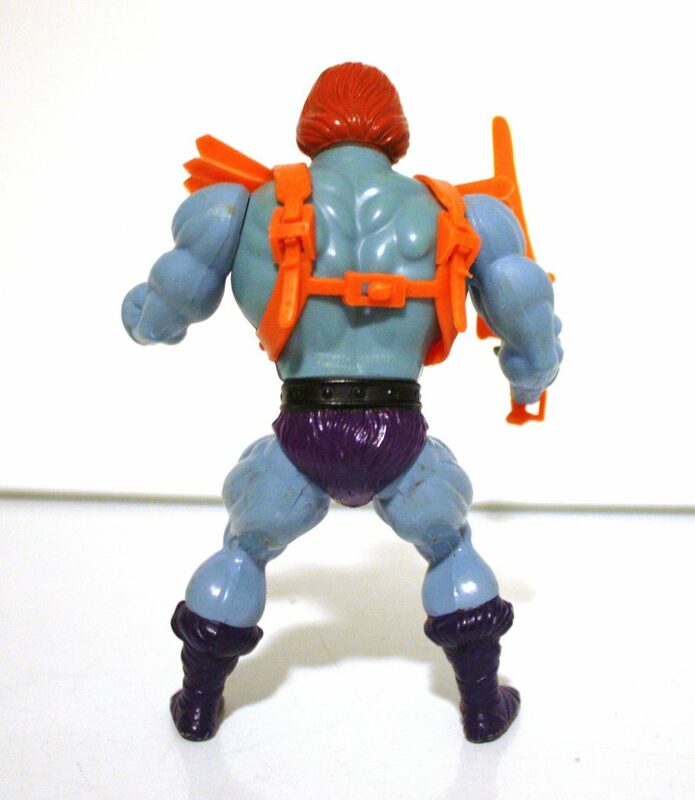 There was a jet pack, a torture rack and a few other goodies. 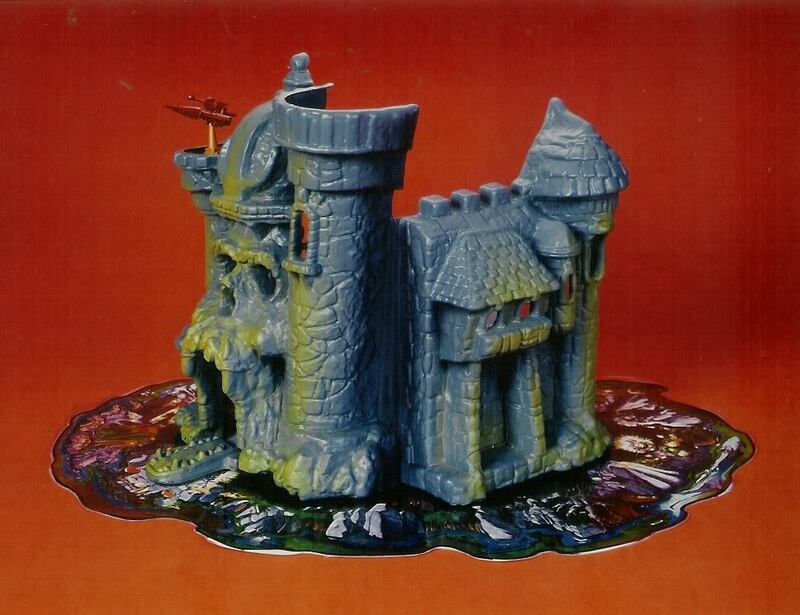 The prototype castle sat on a play mat that worked as a kind of moat. 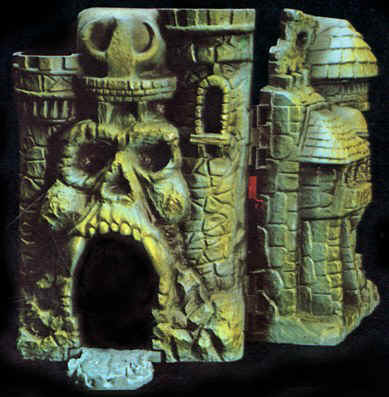 Unfortunately the moat didn’t appear in the final version. 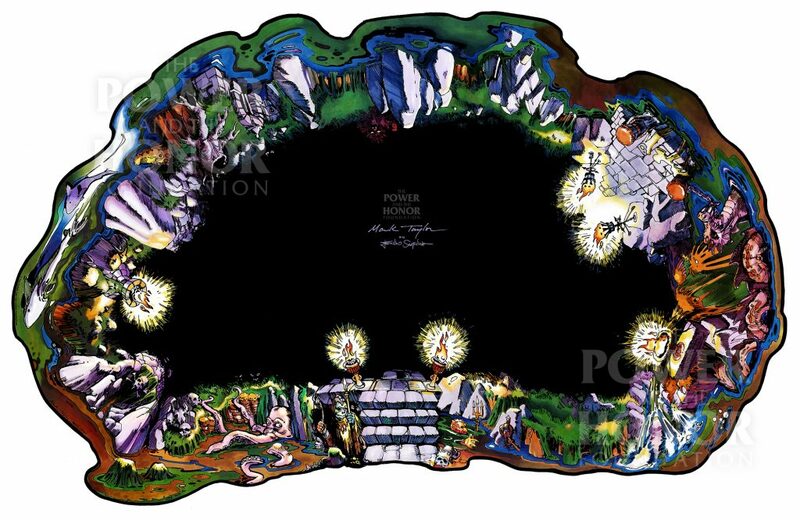 This is a reproduction of the original play mat. Source: The Power and the Honor Foundation. 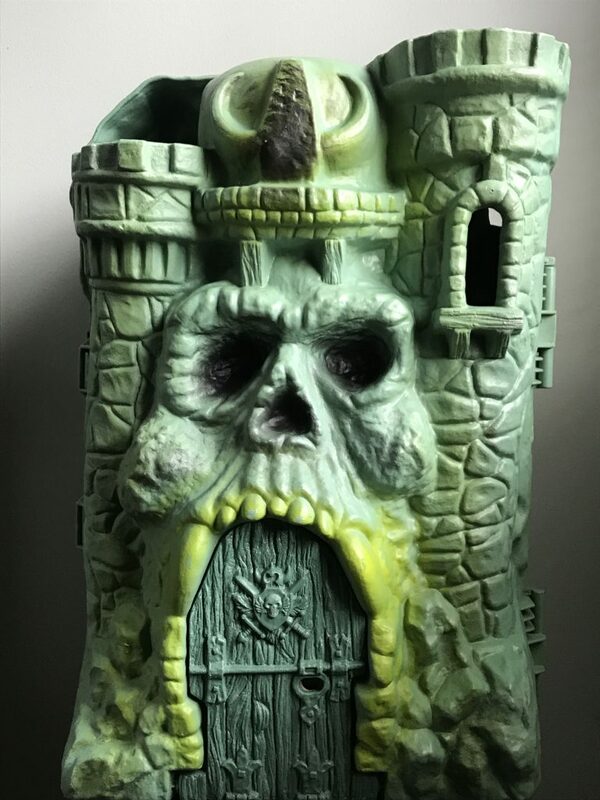 This cross sell art is slightly different from the prototype. 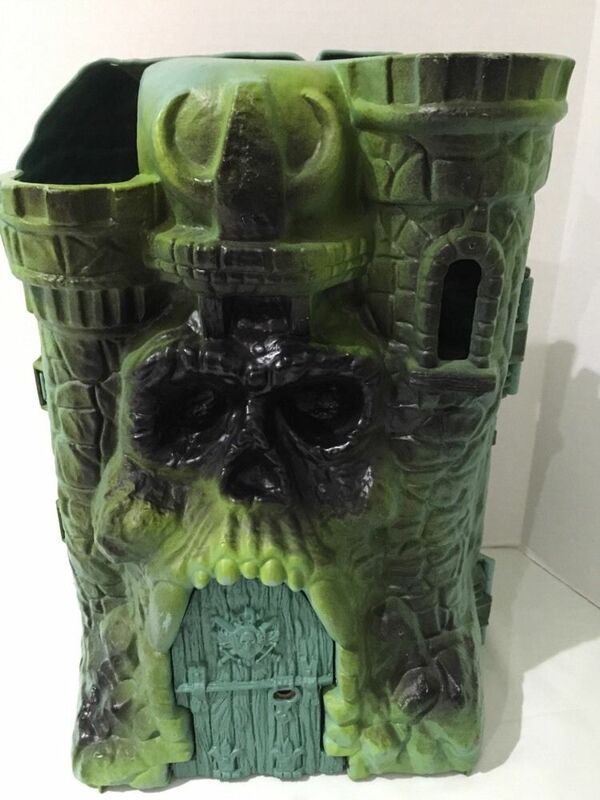 The “pawn” has been removed and a handle has been added. 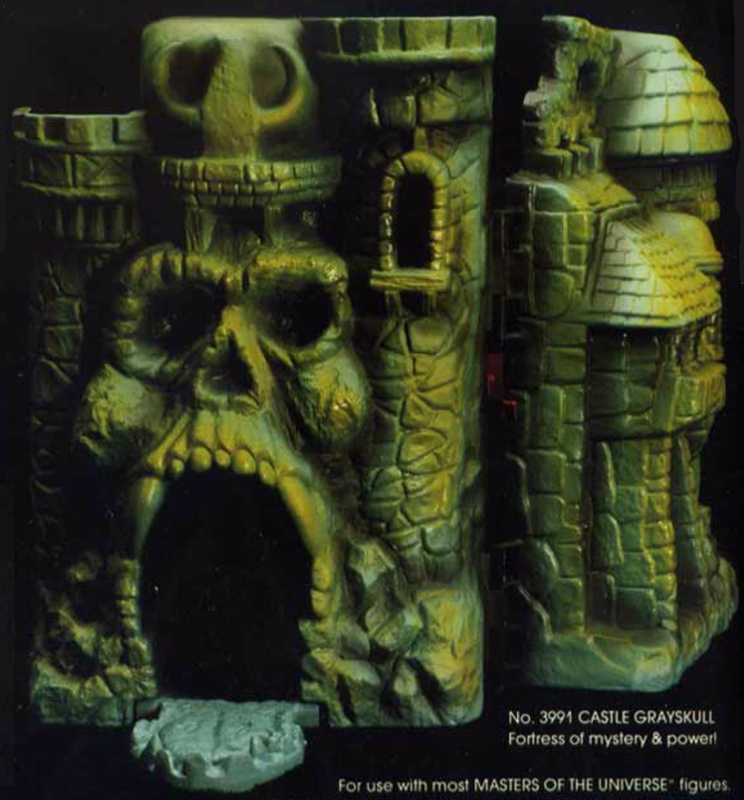 As you can see, there were many large and small changes from the prototype castle, especially in the interior. 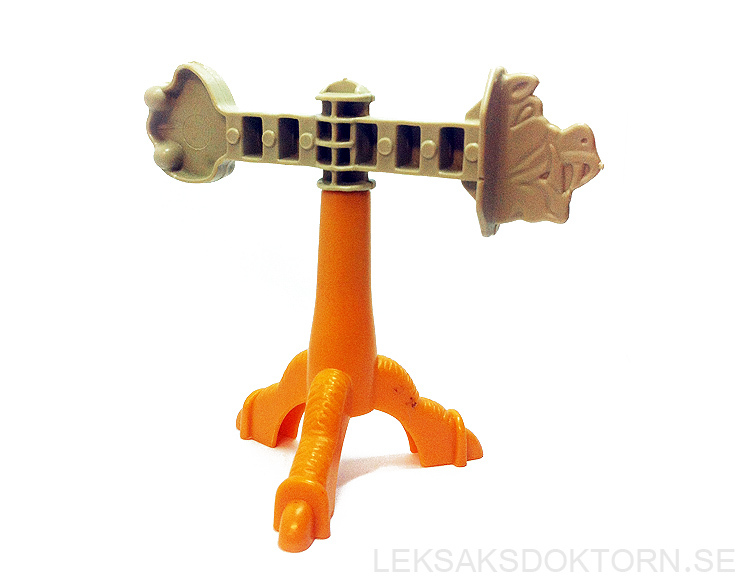 The combat trainer was flattened and simplified. The ladder was given two side rails instead of one in the center. 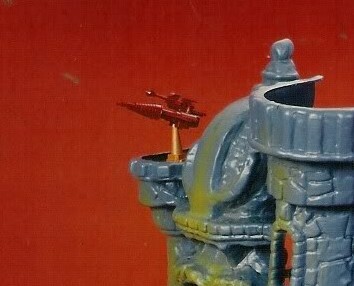 The laser canon was changed out for a newly sculpted version. 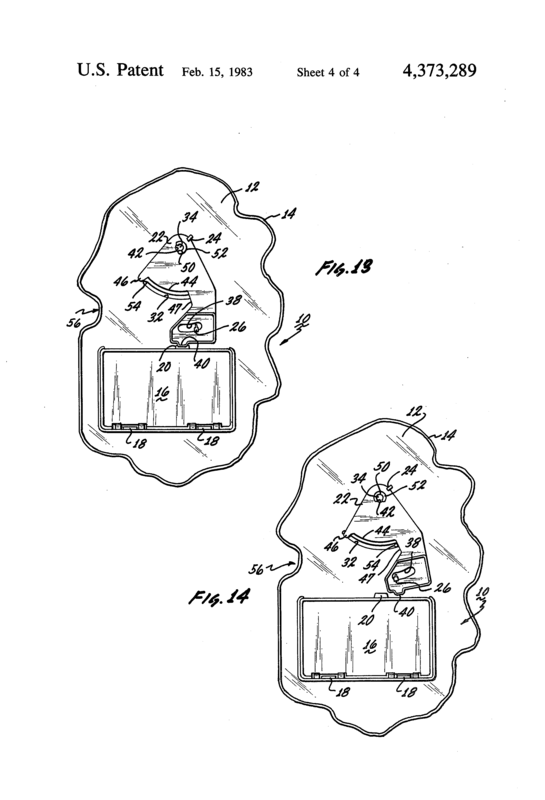 The elevator was made to be rectangular and was operated by gargoyle power. 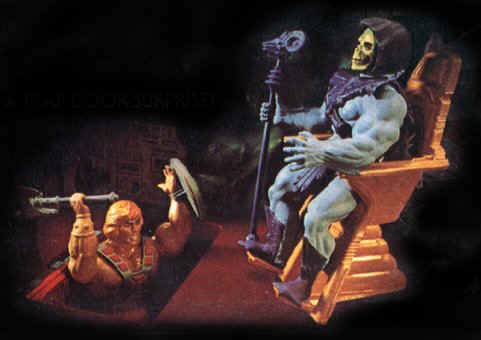 The updated throne looked a bit more science fiction than medieval fantasy (it probably was changed to allow the figures to sit in it more easily). 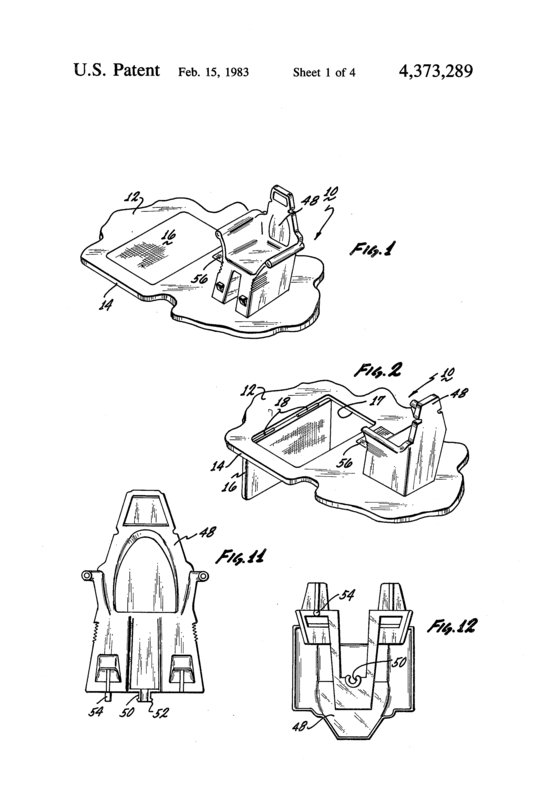 The toy trap door mechanism 10 of the present invention may be easily incorporated into a variety of toys and games where it is desired to provide an element of suspense or surprise. 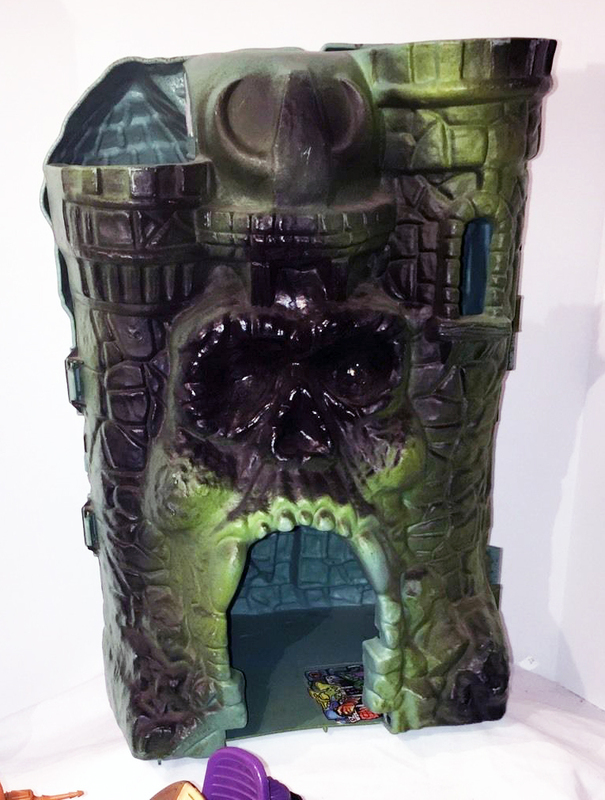 For example, miniature toy figures may be employed, one of which (a hero) sits on the throne or chair 48, and the other of which (a villain) stands on the trap door 16. 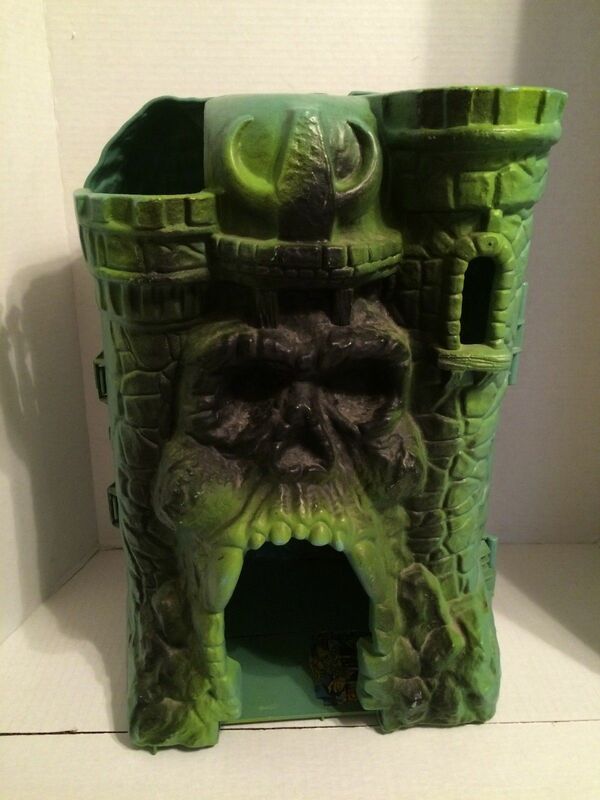 When the hero turns in his chair 48, the villain is dropped through the trap door 16. 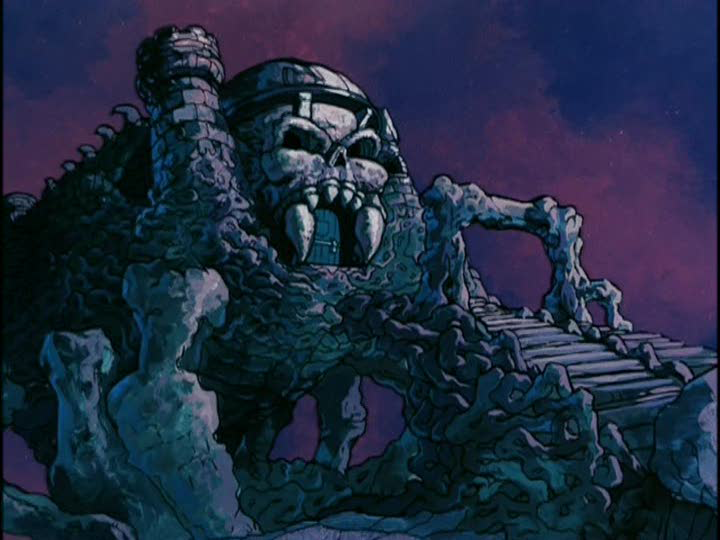 “The visible Castle rises above a fetid Lake/Mote inhabited with assorted exotic and dangerous flora and fauna, the castle extends seven levels/floors into the bedrock of the lake. Each level distorts reality i.e. time and space more than the one above. 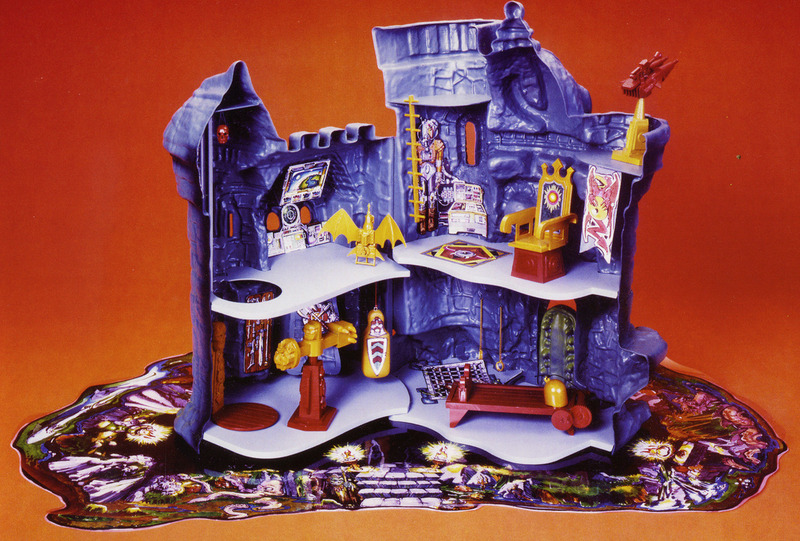 For example; the levels below the weapons storage room (Armory) start with all the weapons that exists within one century each way from the present (MOTU time), the floor below that within five centuries years each way and so on. 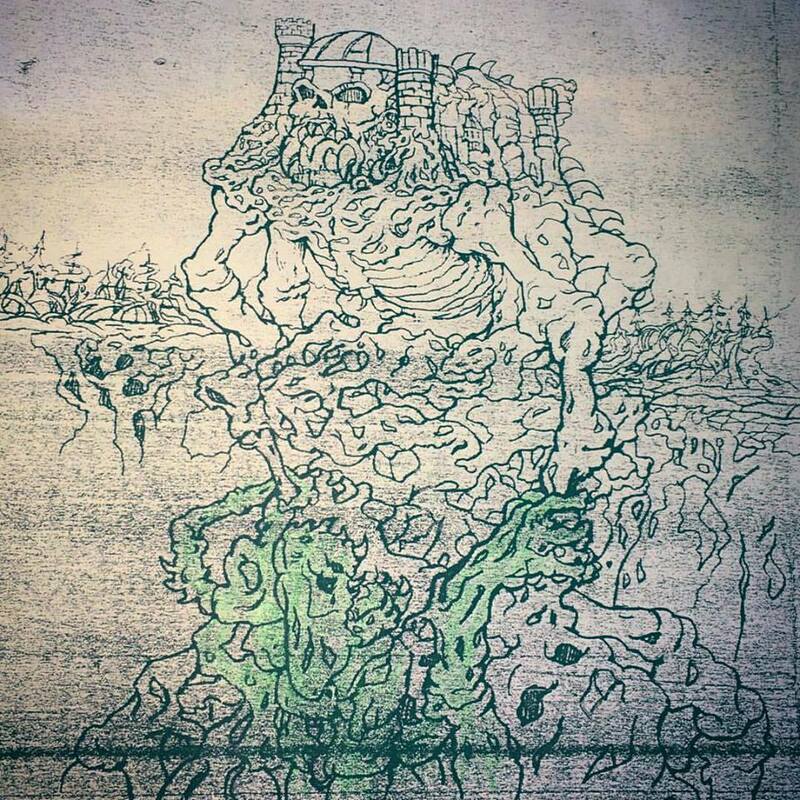 “The Pit of Souls is a [dungeon] containing undying monsters from the beginning and end of time that also extends into the time and space continuum (probably a miniature black hole). 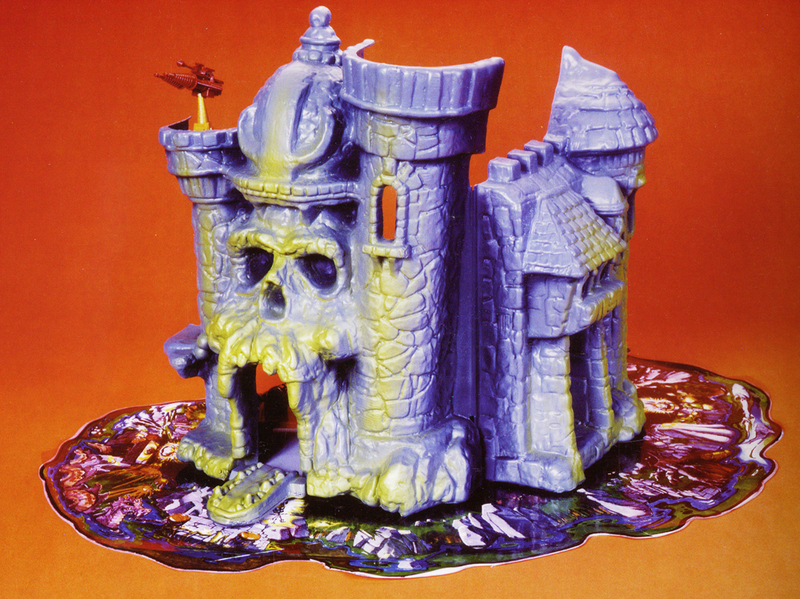 The powers of the castle are linked to these evil captives, Skeletor and his minions would love them released but also fear their potential. One must be very careful when listening to their consul because they are extremely clever and totally evil. 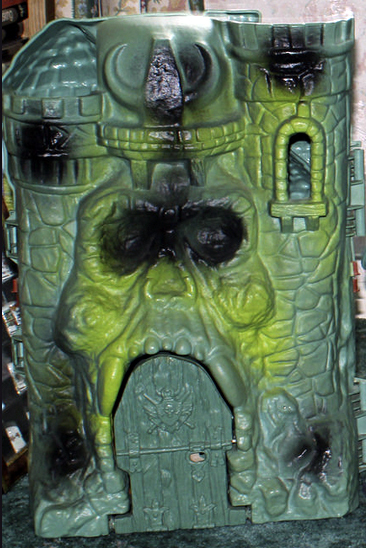 The exterior of the production Castle Grayskull was given several shades of black and pea green spray paint in an attempt to add depth. Sometimes this was successful and sometimes it was not. 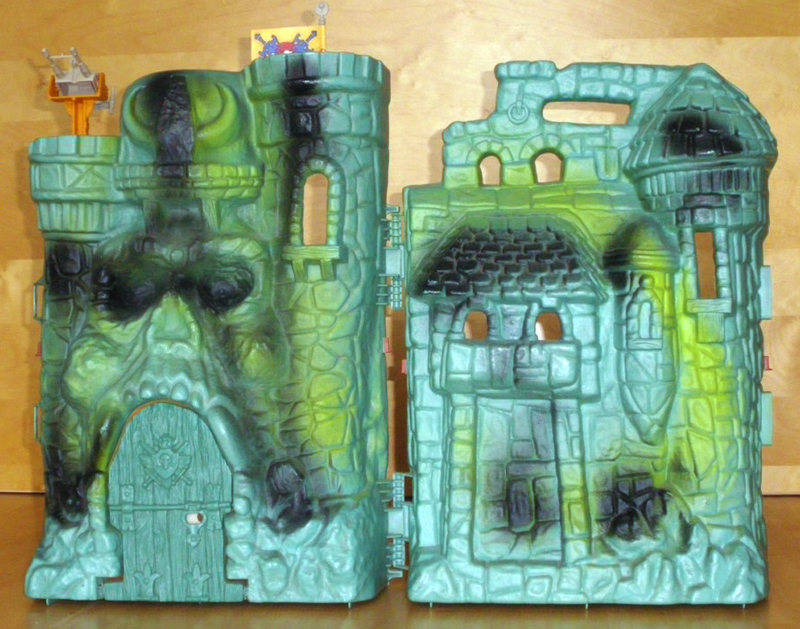 Some Castles, depending on country of origin or year produced, had extraordinarily sloppy paint work. 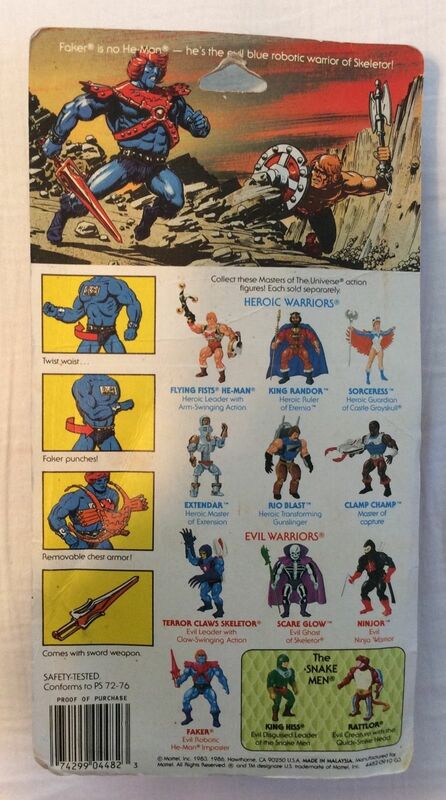 None of them were close to the model used for catalogs and advertising. Image courtesy of Chris Stone. 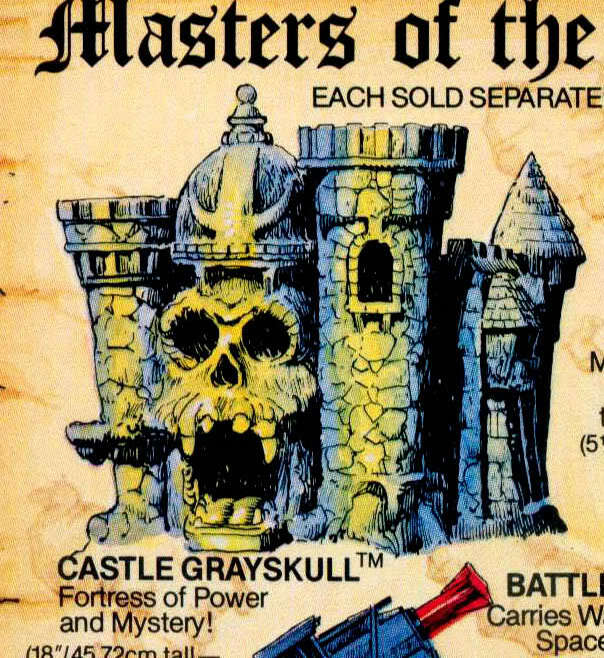 The box art for the castle is, of course, probably the most iconic piece of artwork done for the entire line, which is really saying something. 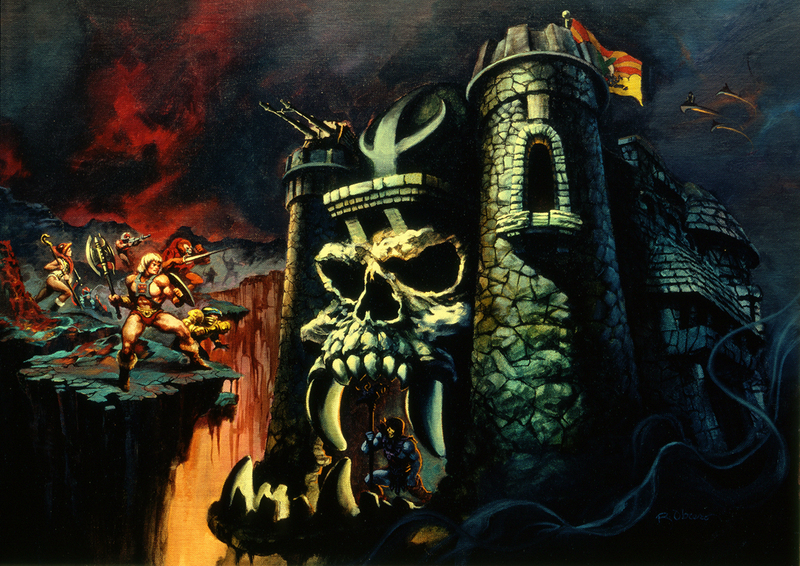 Rudy Obrero‘s depiction of Castle Grayskull was instantly transfixing and mysterious. 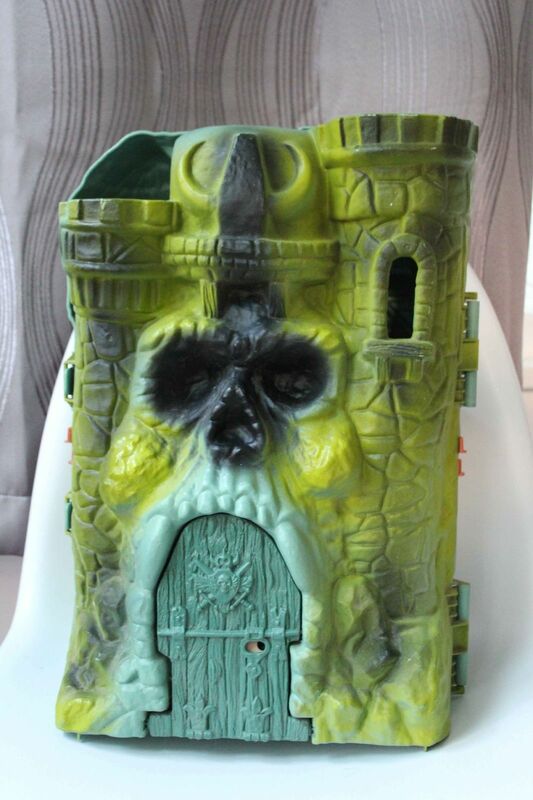 It probably sold the toy almost single handedly for that first year. 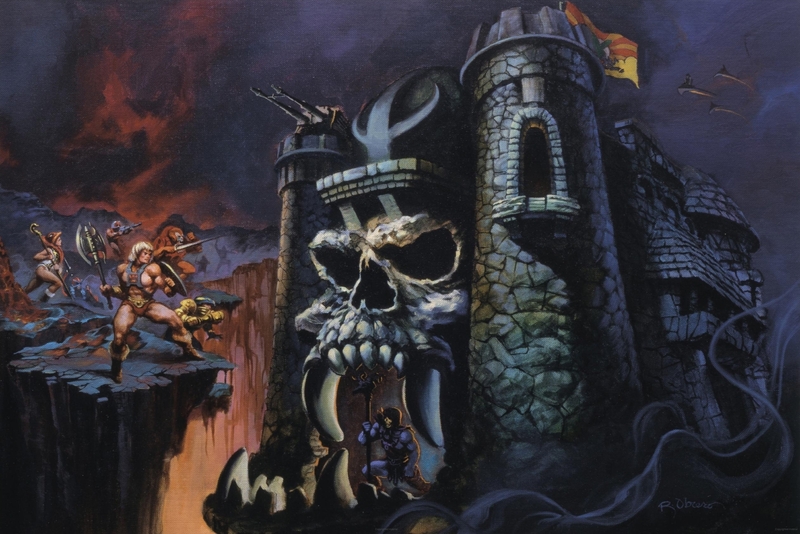 As discussed in my Wind Raider post, Obrero was given no notes on characters and assumed that the castle belonged to Skeletor, based on its appearance. In retrospect, Obrero wasn’t really in error on this. 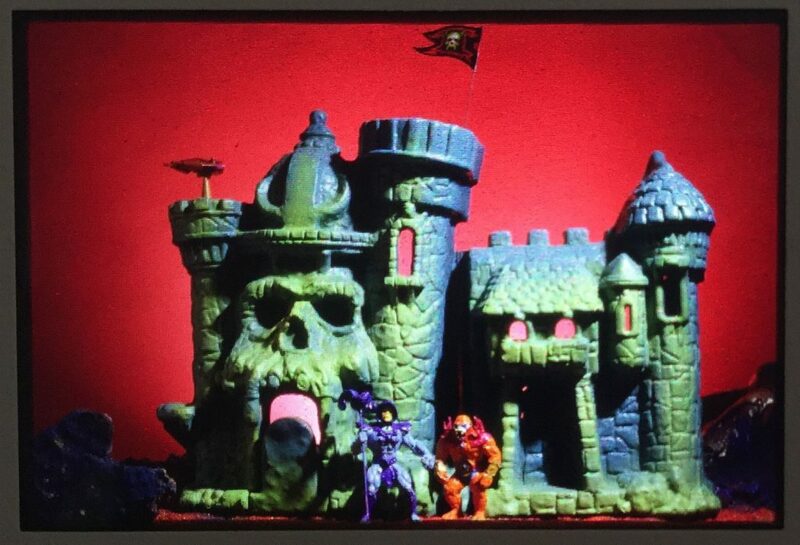 At this time in the brand’s history, the castle could belong to whatever warrior was powerful enough to hold on to it. 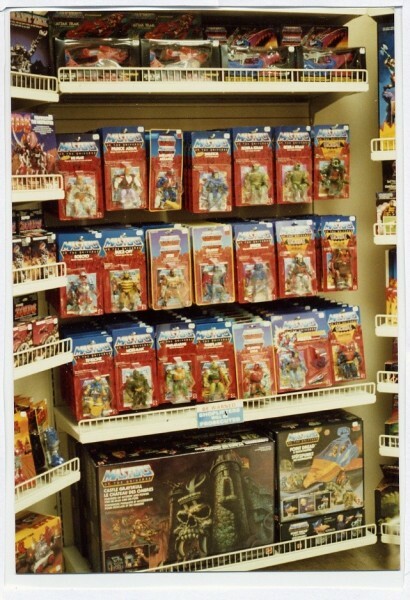 It wasn’t established as a permanent base for heroic characters until later. 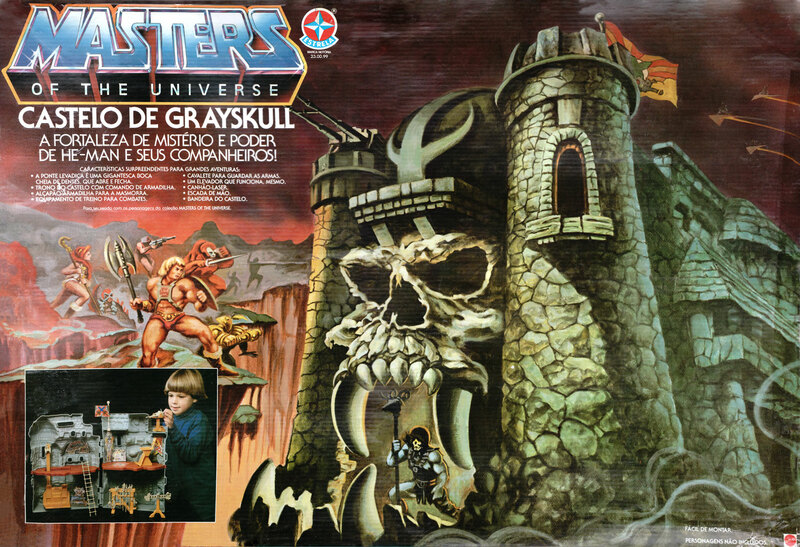 The box itself featured the Obrero art on front, some product pictures (with prototype figures) on the sides, and line art on the back featuring the castle and the first year’s figures and vehicles. 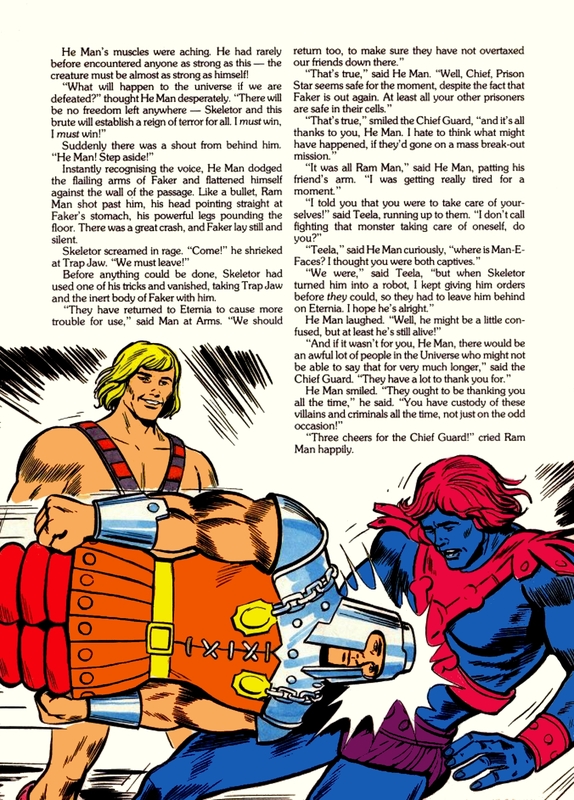 The line art was made by tracing early product photos. 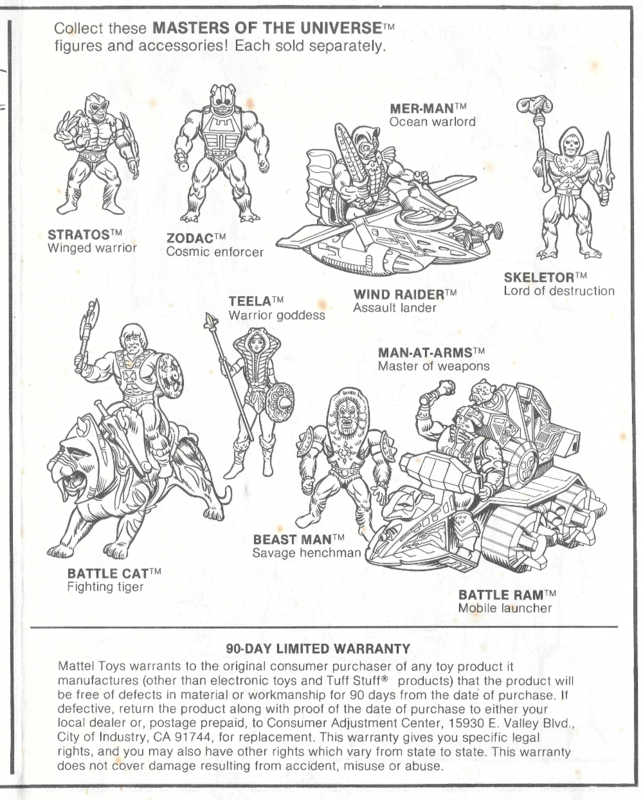 The line art was altered after the first year to show off some of the new figures, and was created from the full color cross sell artwork that was featured on the backs of the figure and vehicle packaging. 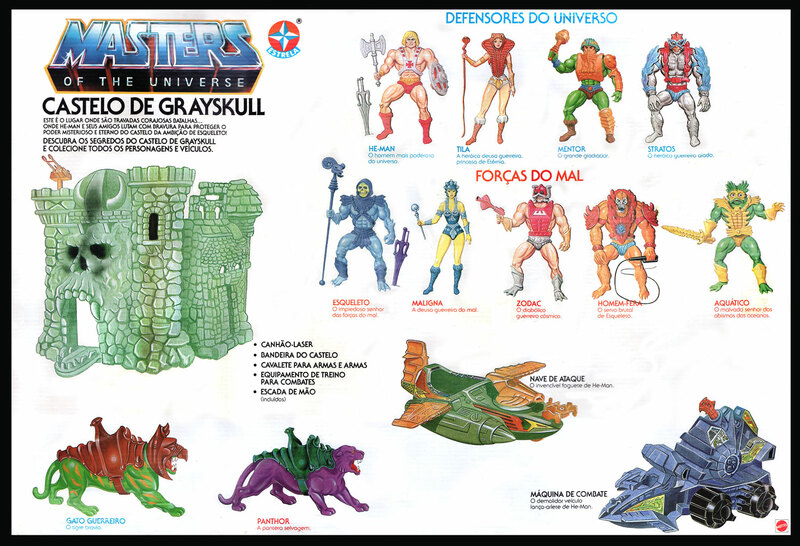 On the Brazilian Estrela version of the box, the front and back artwork was modified for some reason. 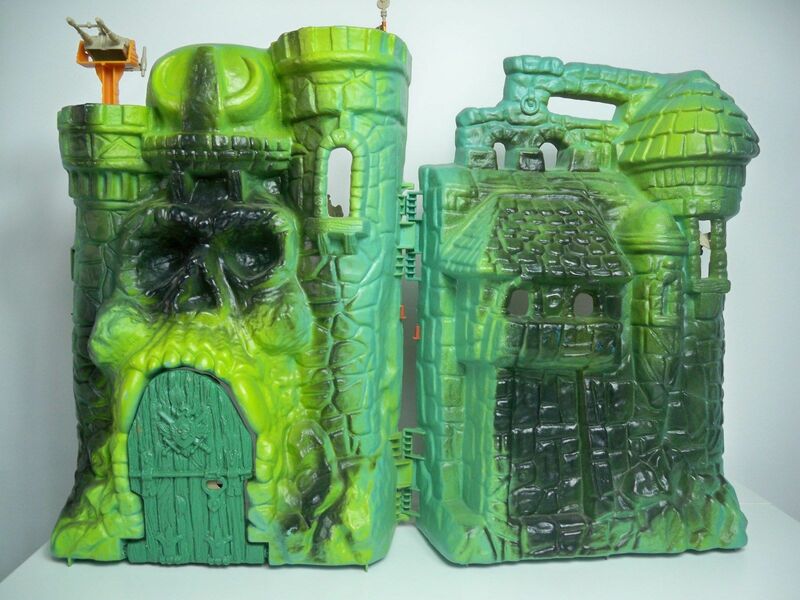 Even the product photos were changed out. 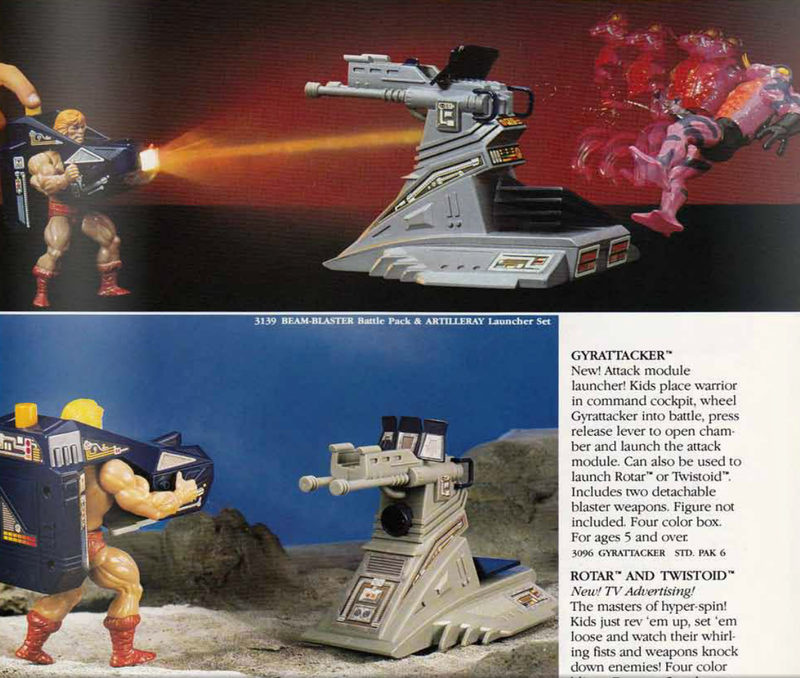 Something similar was done with the artwork on the Estrela Battle Ram box. 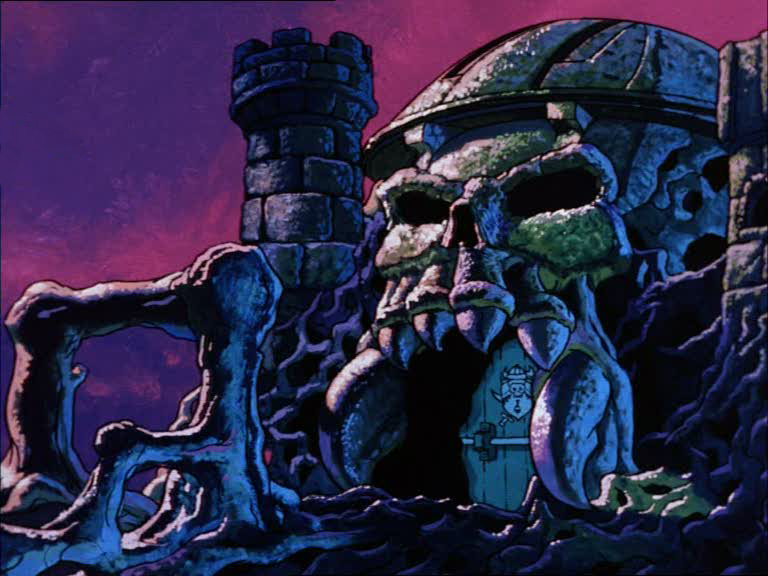 One of the most iconic depiction of Castle Grayskull came from the Filmation cartoon. 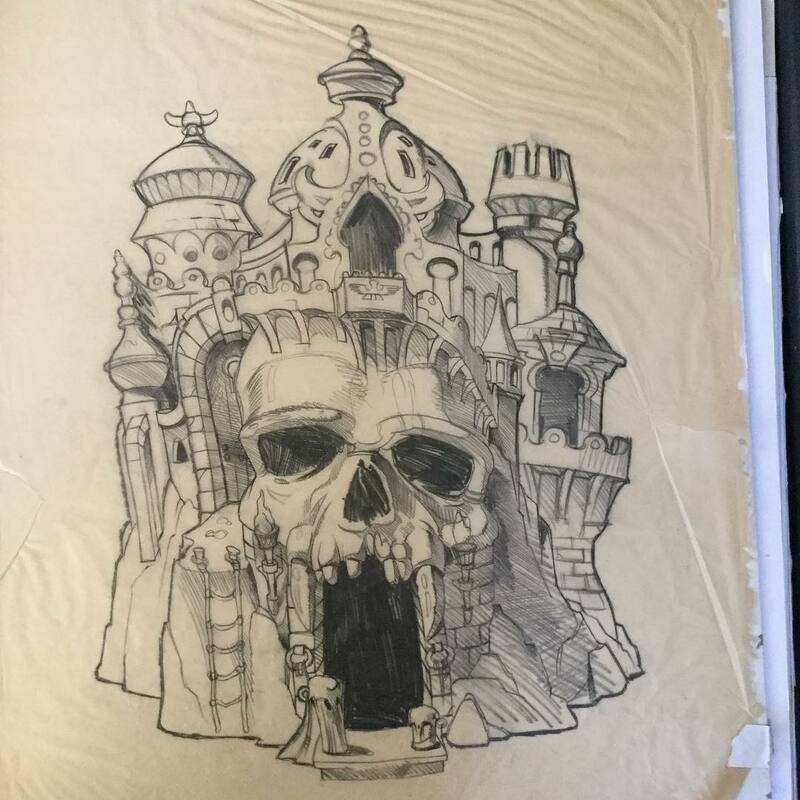 The cartoon design was quite unique. 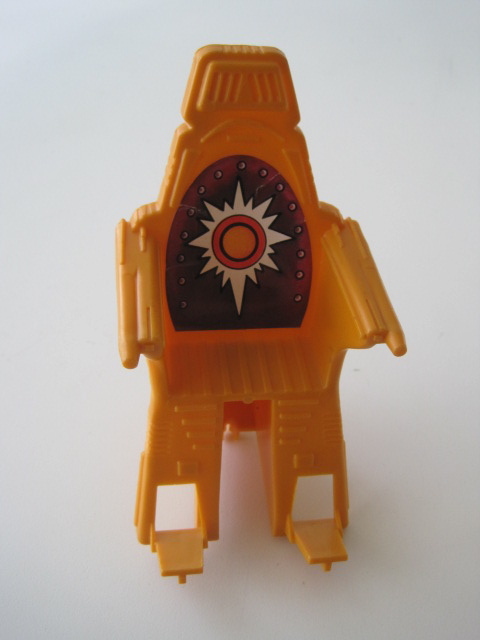 The teeth were enlarged and the proportions of the towers and helmet were changed. 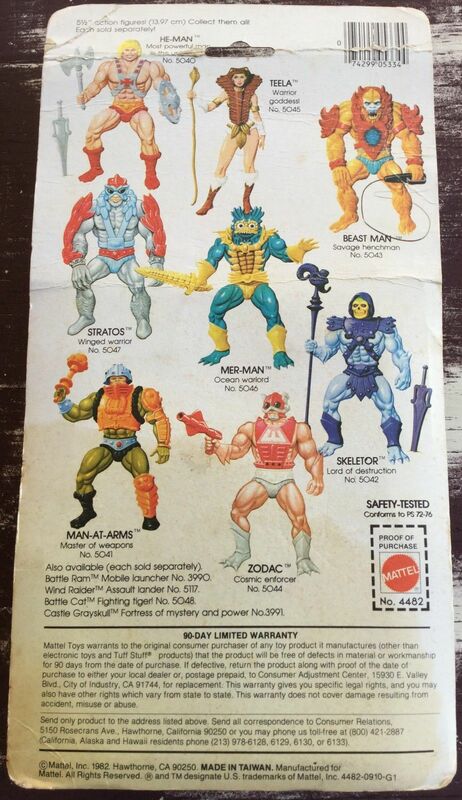 While the toy version contained quite a few technological artifacts, the Filmation version was pure fantasy. 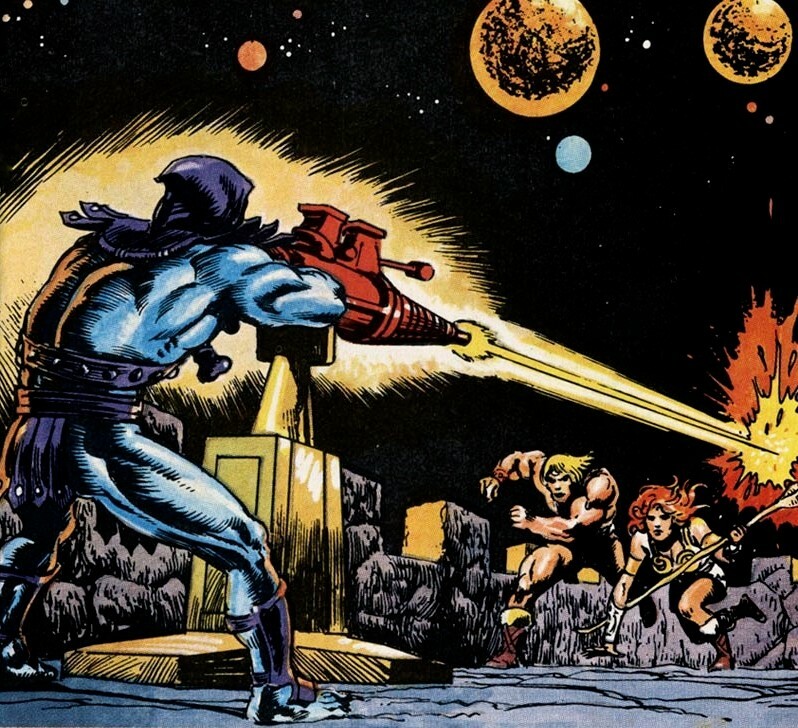 Several of these images come from the Eternian Backgrounds blog, which is worth visiting. 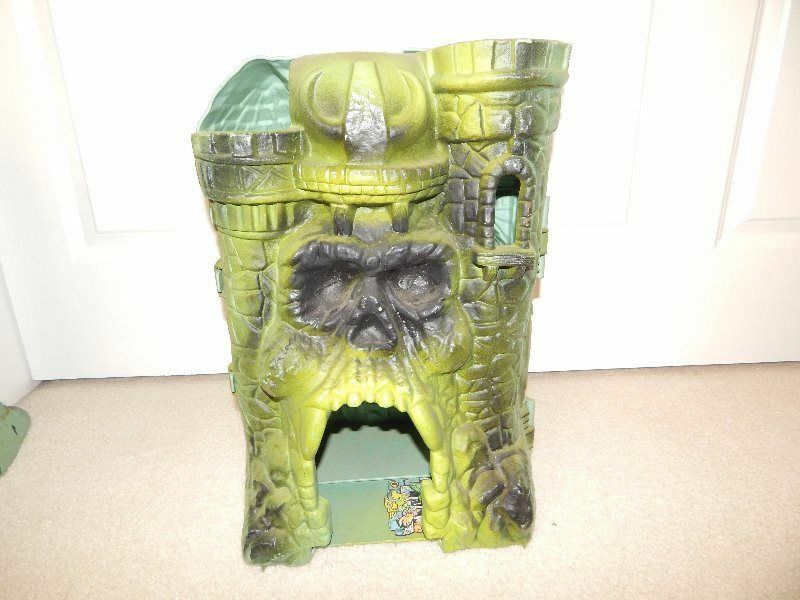 Also see the Inside Grayskull blog for some great shots of the castle interior. 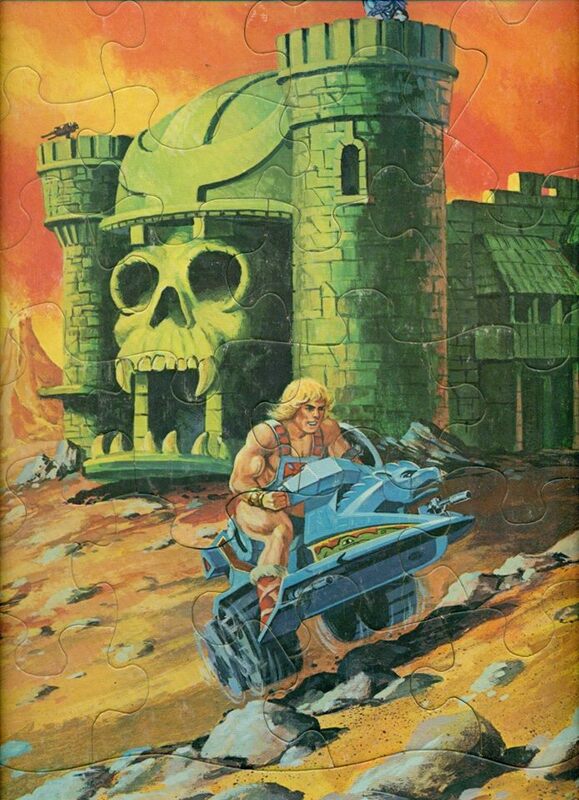 For those of us who grew up in the 80s, every week we saw Prince Adam getting out of jams by invoking the power of Grayskull. 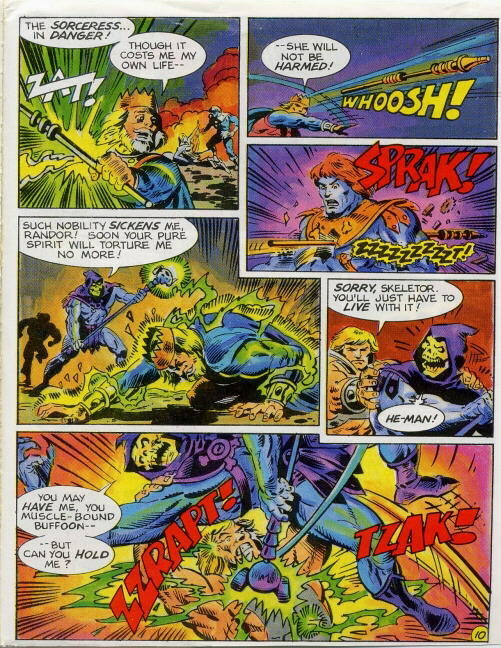 No matter where he was at the time, the sequence would flash him back to the front of the fortress of mystery and power, amid flashing magical lightning and a pulse-pounding musical score. 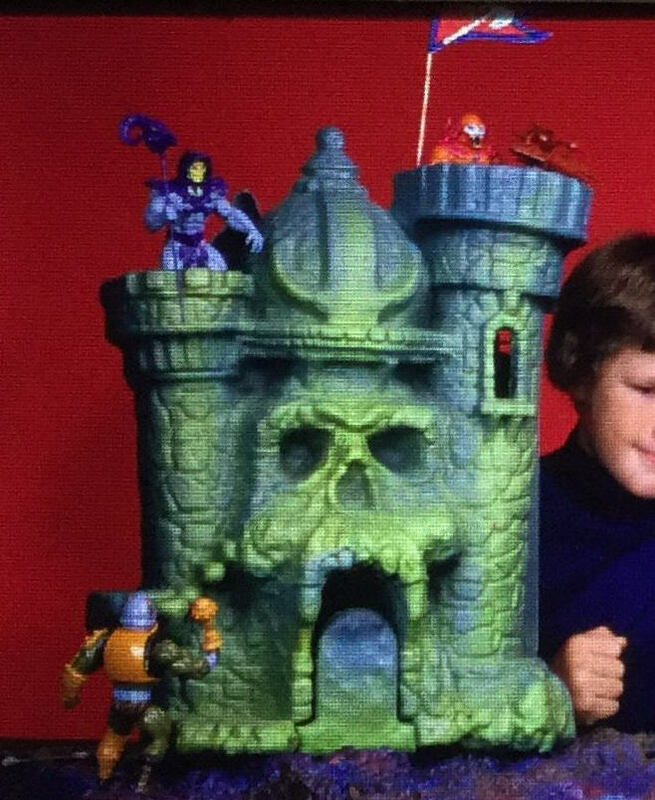 Castle Grayskull was burned into our brains. 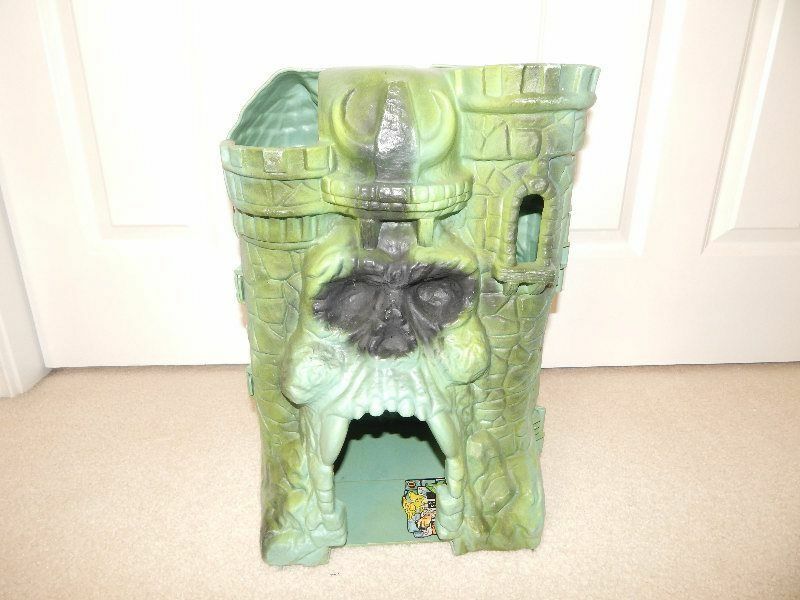 No blog post on Castle Grayskull could be exhaustive – there is simply too much to cover. I may need to revisit the topic in a future post. 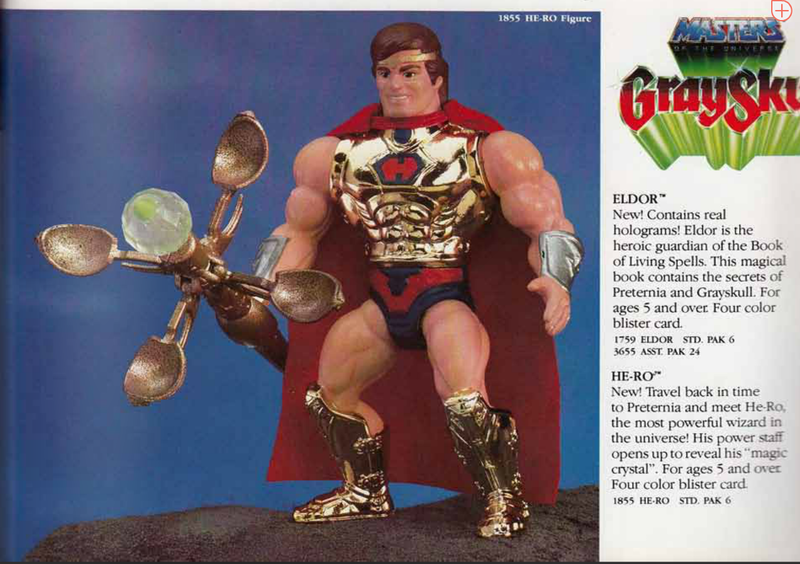 Conventional wisdom about the 1987 lineup says that Mattel was putting out a lot of reused parts in the new figures (like Scare Glow, King Randor, Clamp Champ). But really parts reuse existed in every year of the line. 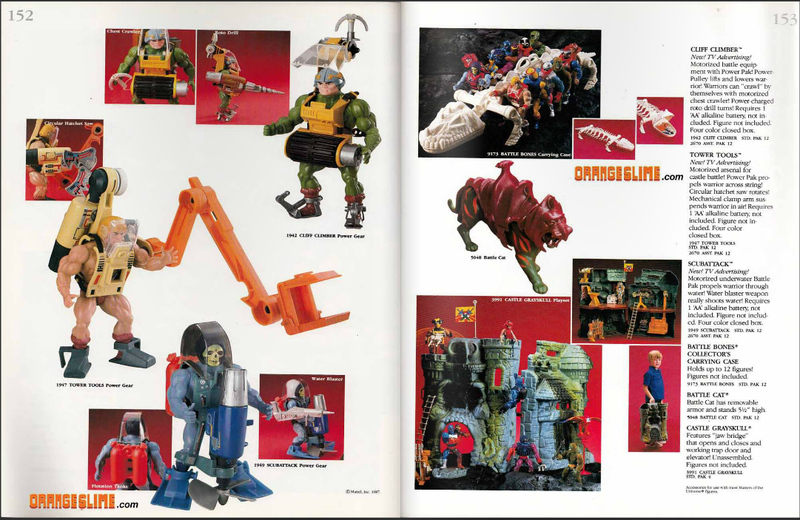 Taken altogether, there was quite a lot of new tooling in 1987, and a lot of new ideas to expand the line in new directions. 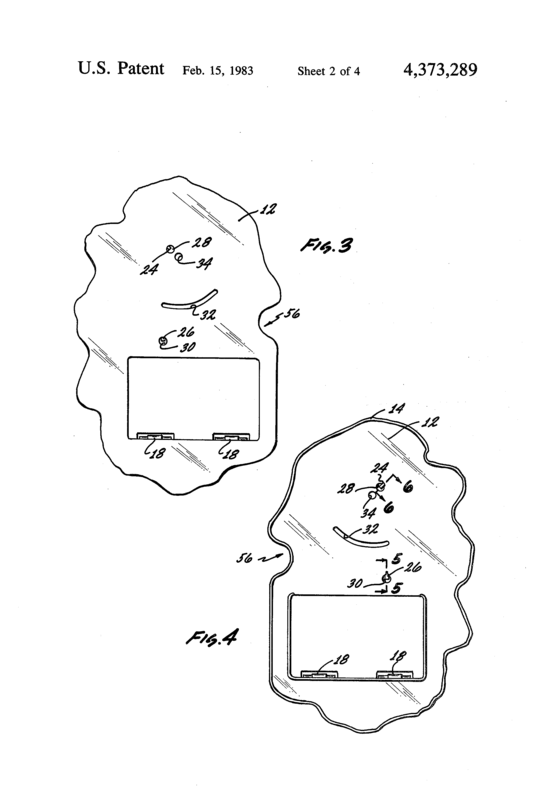 It’s a pity that the line fizzled out before these ideas could be fully explored. 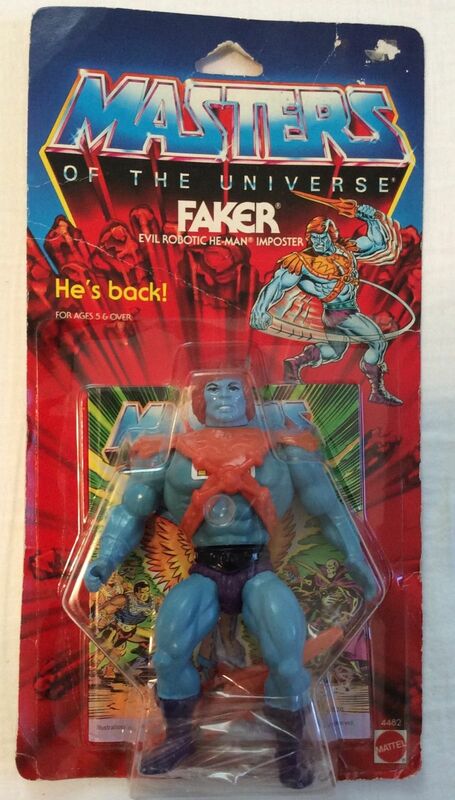 When I was a kid, I was first introduced to Faker when visiting with a friend. I don’t remember him being a highly demanded figure among my peers. 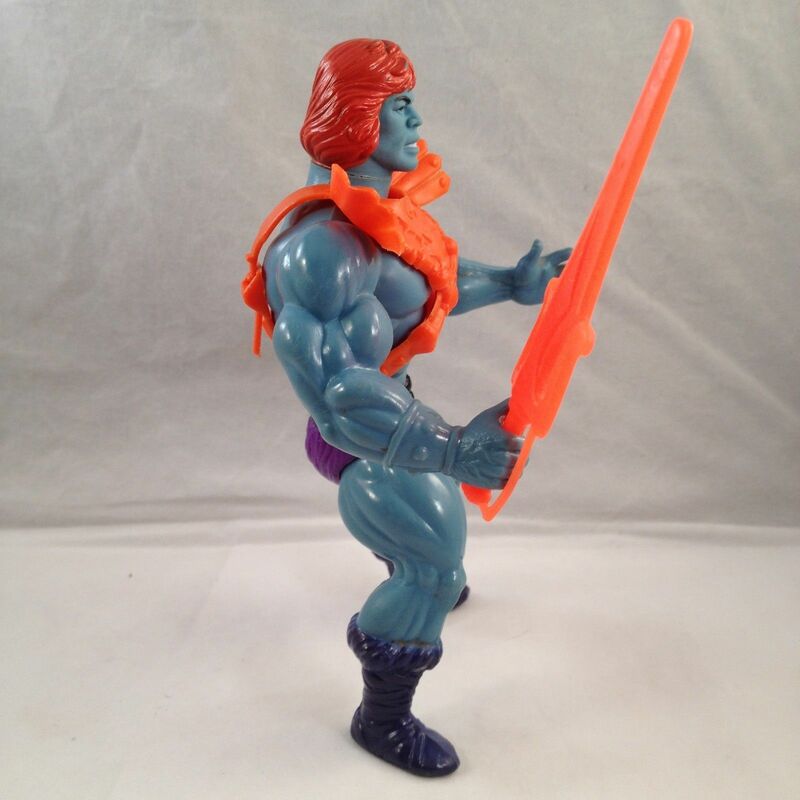 I liked him but I don’t remember begging my mom for a Faker figure. 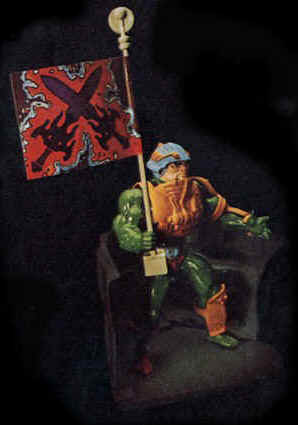 But among the adult collector community, Faker (along with Zodac) seems to have garnered something of a cult following. I can’t quite put my finger on why that might be, but at the gut level I’m right there with the rest of the fans. 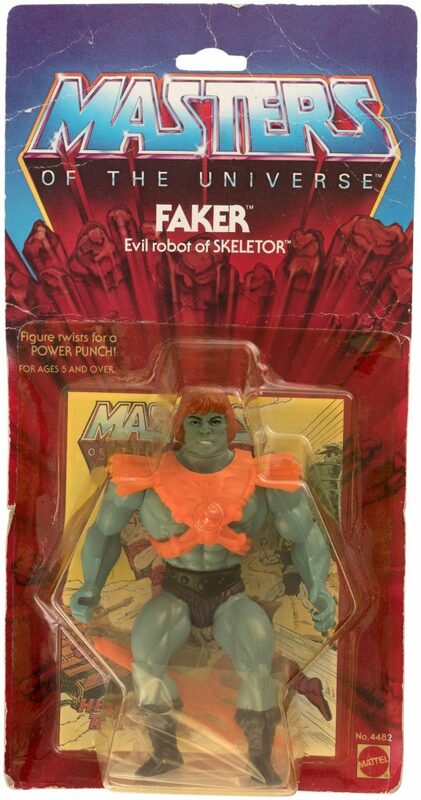 By the time Faker was released in 1983, Mattel would have known they had a hit on their hands with Masters of the Universe. 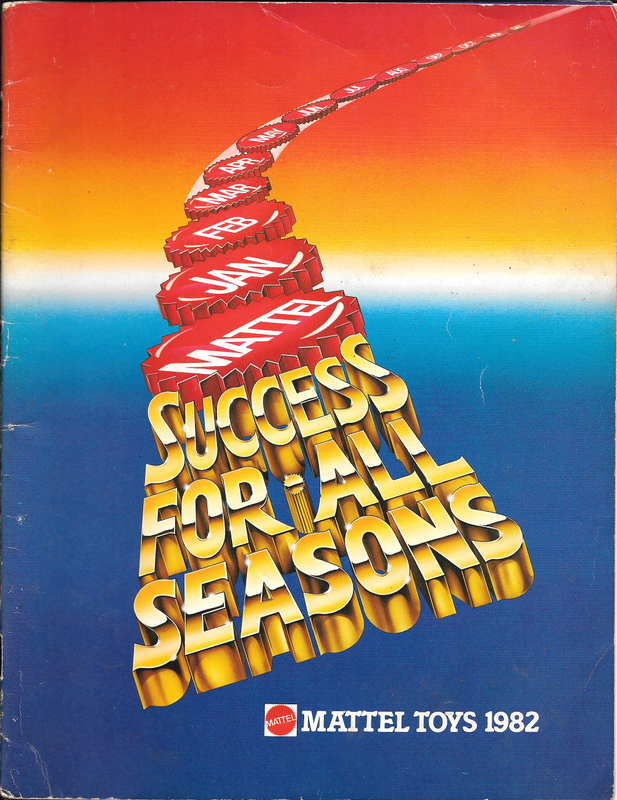 The brand had already made many millions of dollars in 1982, the year of its introduction. So was Faker released because he was cheap to make and the profit margins would be higher than other figures? 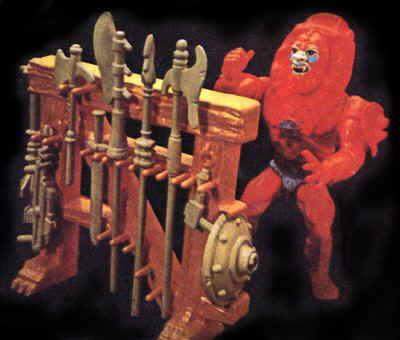 Or was it because he required no new tooling and would allow Mattel to have another figure out in the market without much lead time? I tend to think it was the latter. 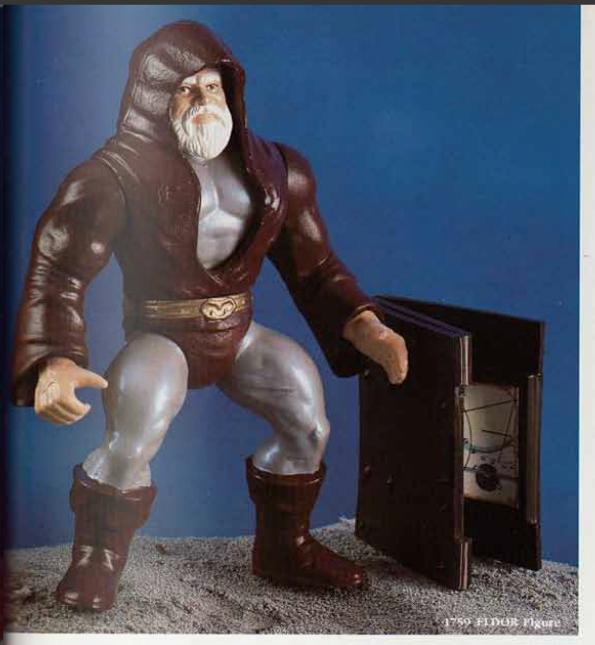 New tooling would take time to put together, and Mattel showed they were willing to invest in new sculpts in the 1983 lineup. 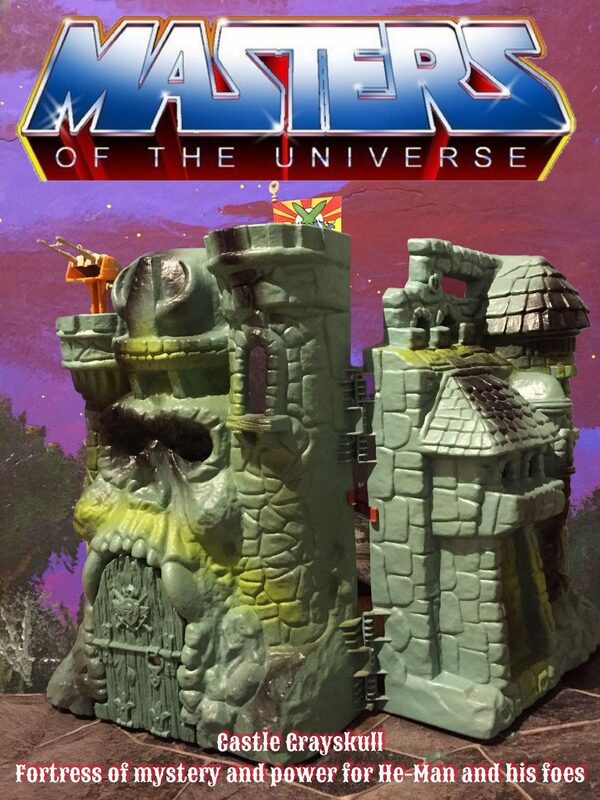 Meanwhile I would think they would wish to capitalize on the unexpected success of the MOTU line as quickly as possible. 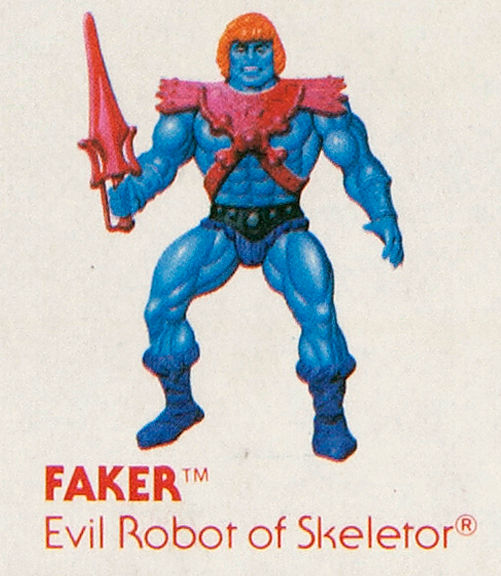 In terms of design, Faker is, very simply, a He-Man figure with Skeletor’s sword and armor, recast in eye-catching candy colors. 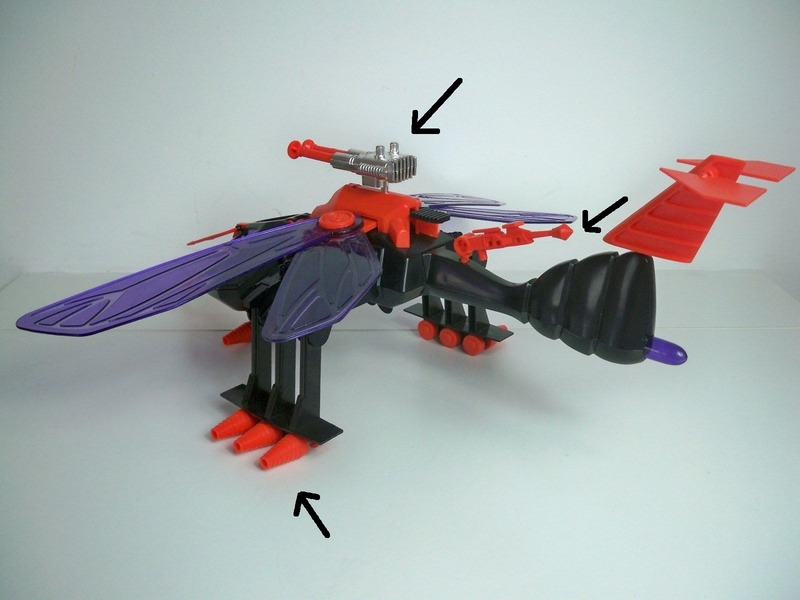 In terms of parts reuse, no other figure was as direct a reuse of previous parts as Faker. 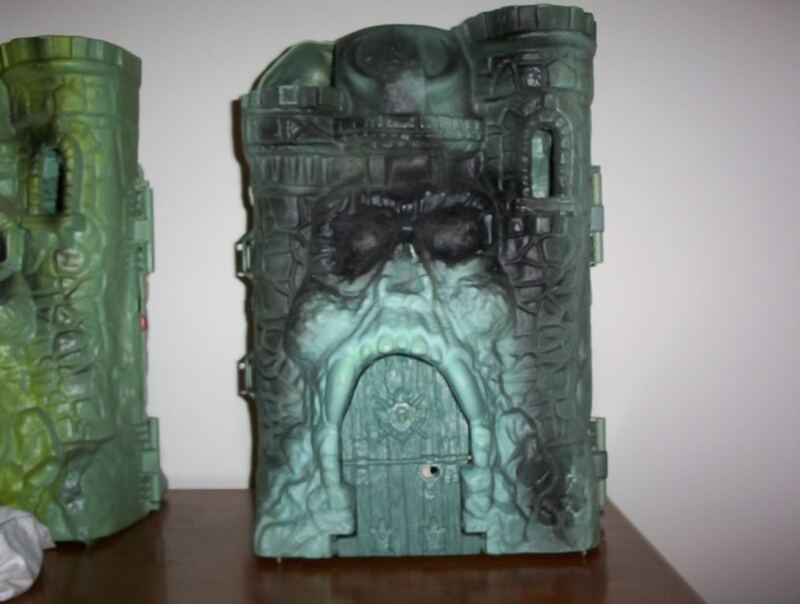 Even Stinkor and Moss Man (reused from Mer-Man and Beast Man, respectively) got some scent added to their plastic or a coating of green fuzz, in the case of Moss Man. 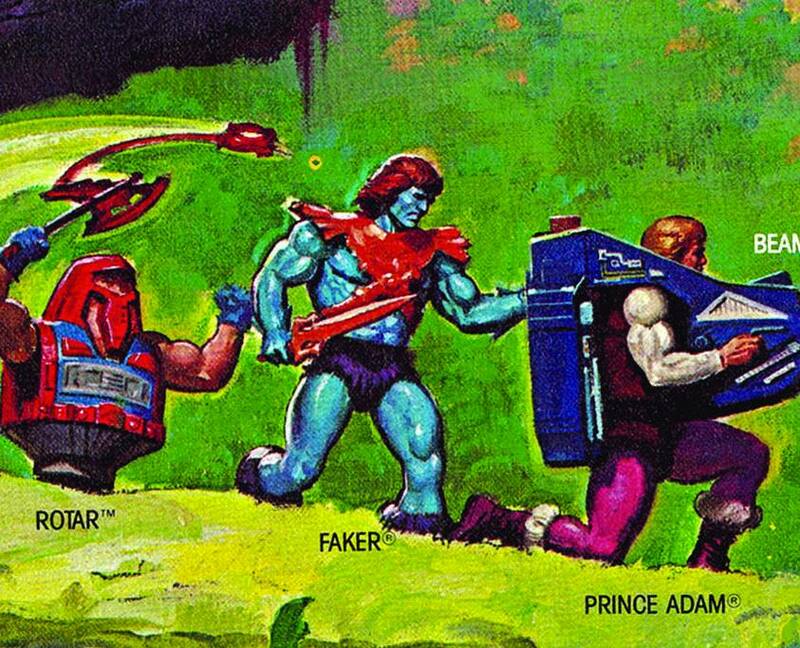 Faker is just Faker. 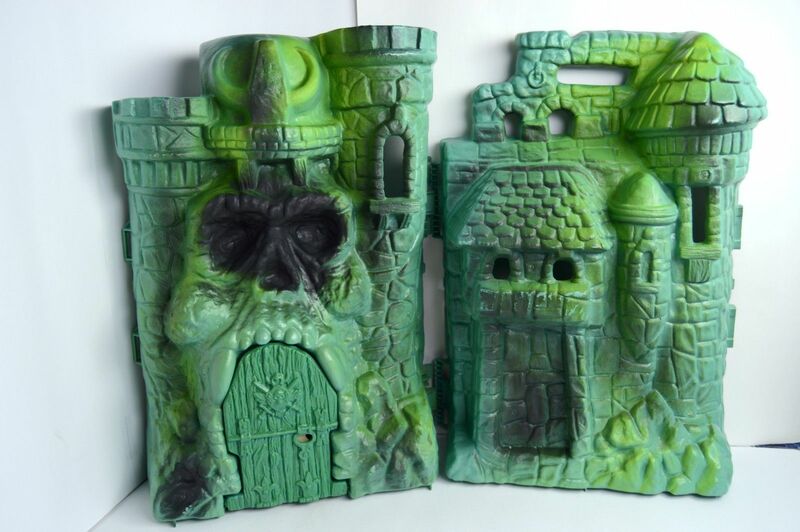 There is something appealing about that design though. Maybe it’s the color scheme. 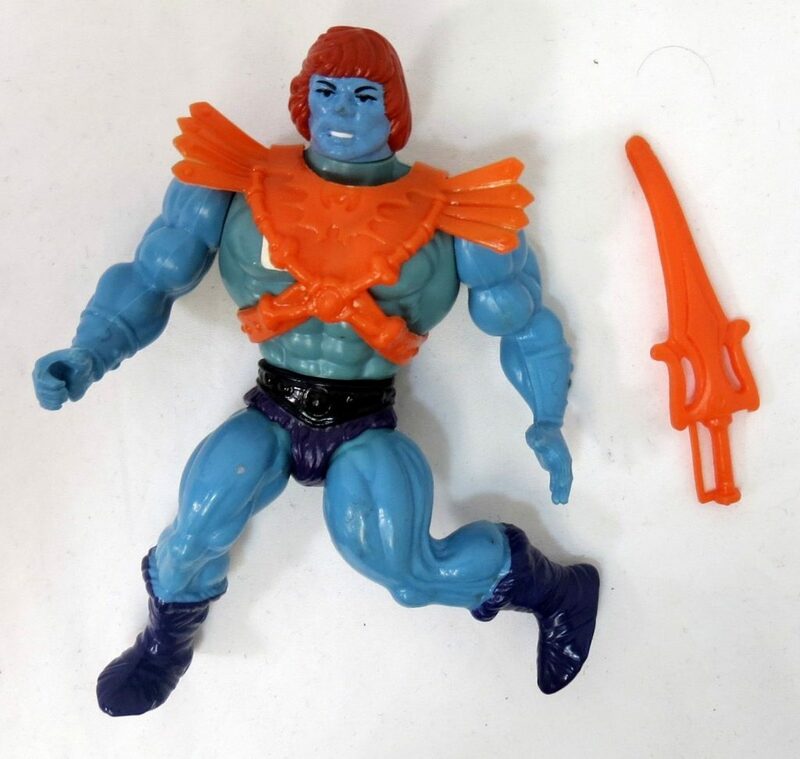 Orange and blue are complimentary colors, after all. 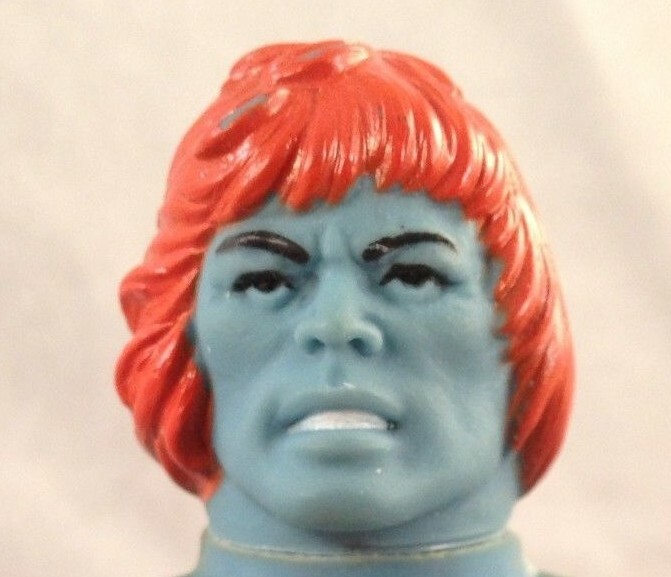 The Faker prototype below is just a repainted He-Man figure. 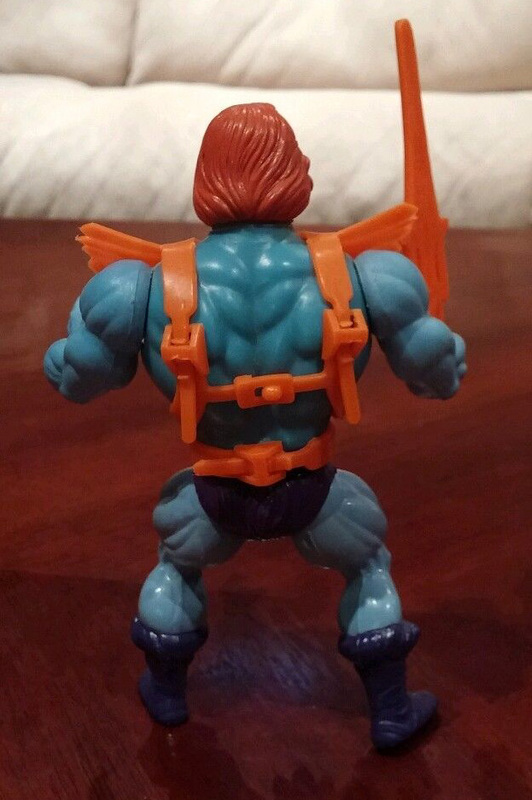 You can see a bit of the original color coming through on one of the legs. 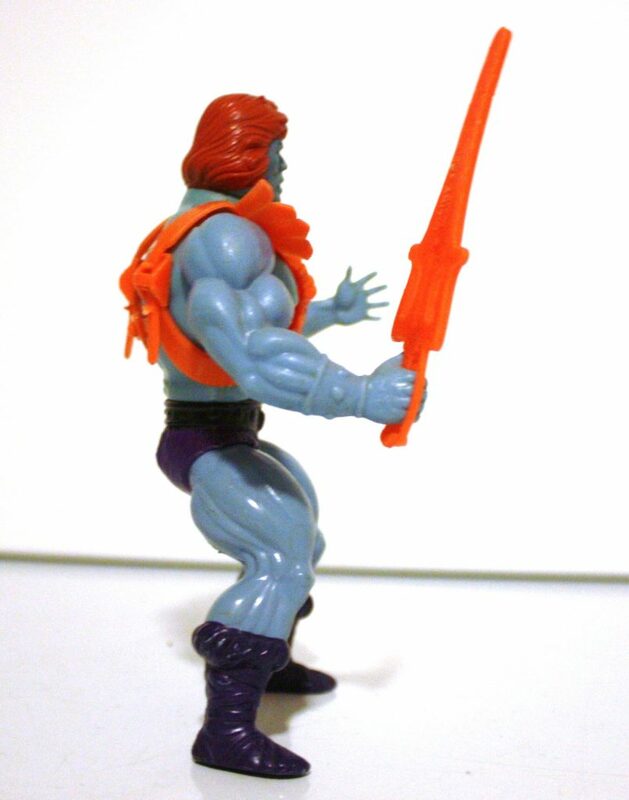 The prototype has the same orange color on the hair as on the armor and sword. 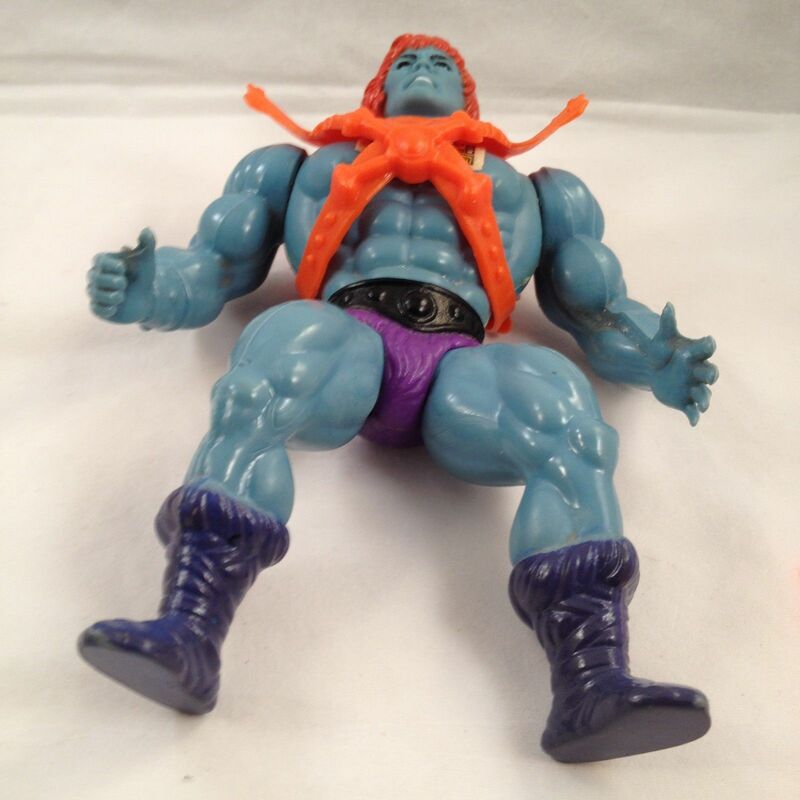 You can see this is made from an earlier He-Man figure, because it has the irregular looking belly button common on early He-Man figures. 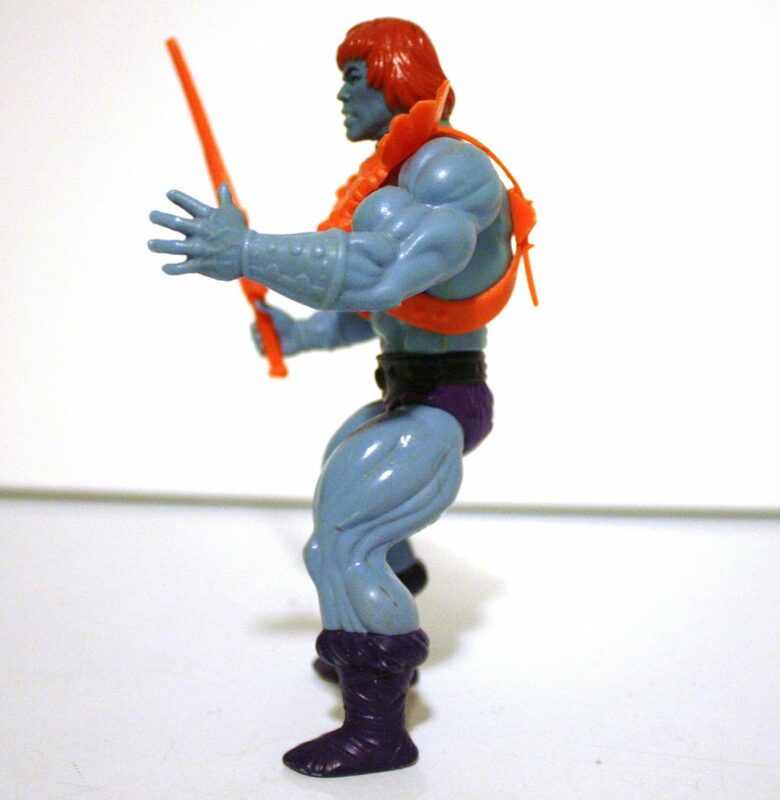 Some production Faker figures lack the belly button, just as He-Man did starting in 1983, but others retain it. 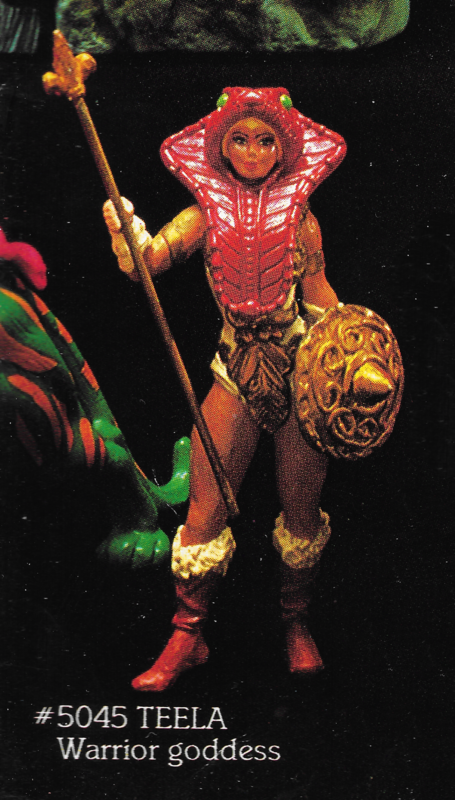 The prototype below has red eyes, while the production figure had black eyes. 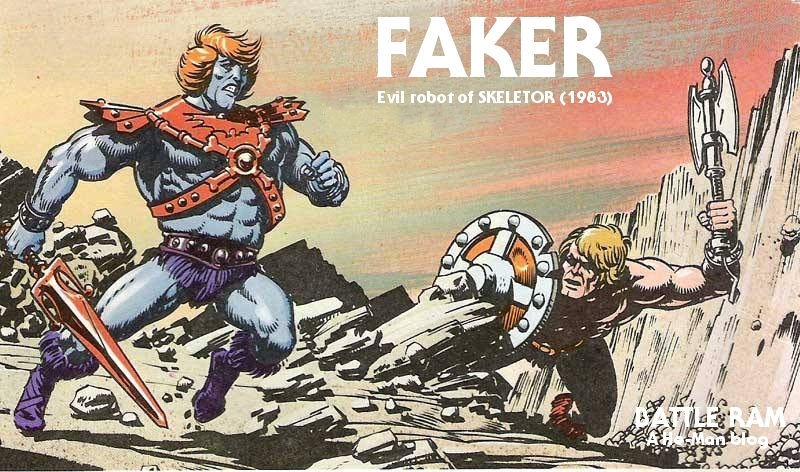 It’s possible that the idea of Faker being a robot was not the original concept for the character. 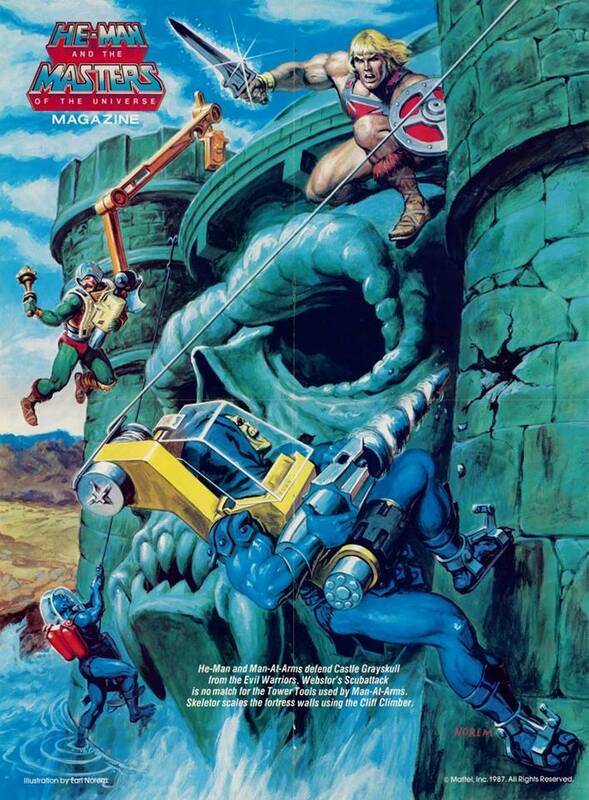 In this 1982 color-changing advertisement, illustrated by Alfredo Alcala, Faker is described as having powerful muscles, and there no mention of robotic parts. 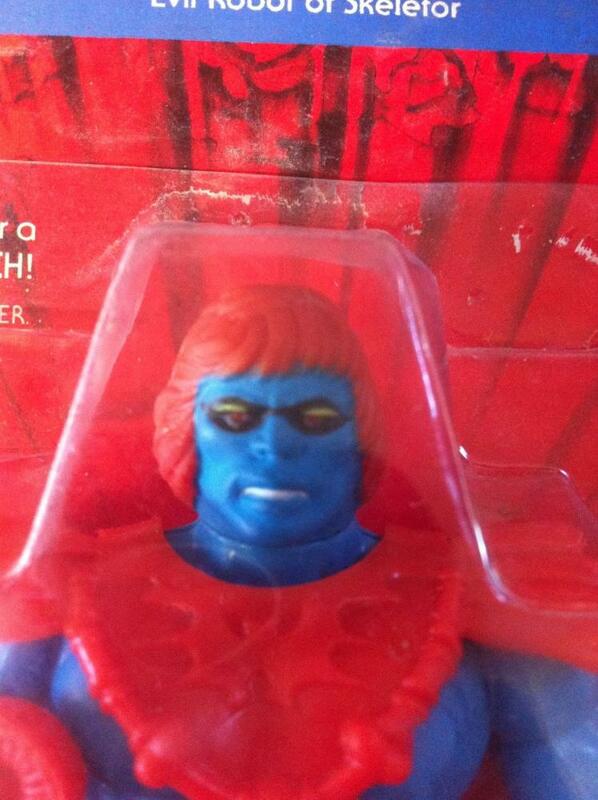 Faker came with the sticker on the chest, mostly hidden under the armor. 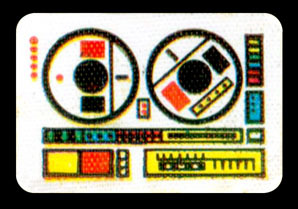 It looks like it’s meant to represent his robotic control panel. To me it actually looks more like a reel-to-reel tape system. I like to think that Faker would be rocking out to The Fixx as he launched his assault on Castle Grayskull. 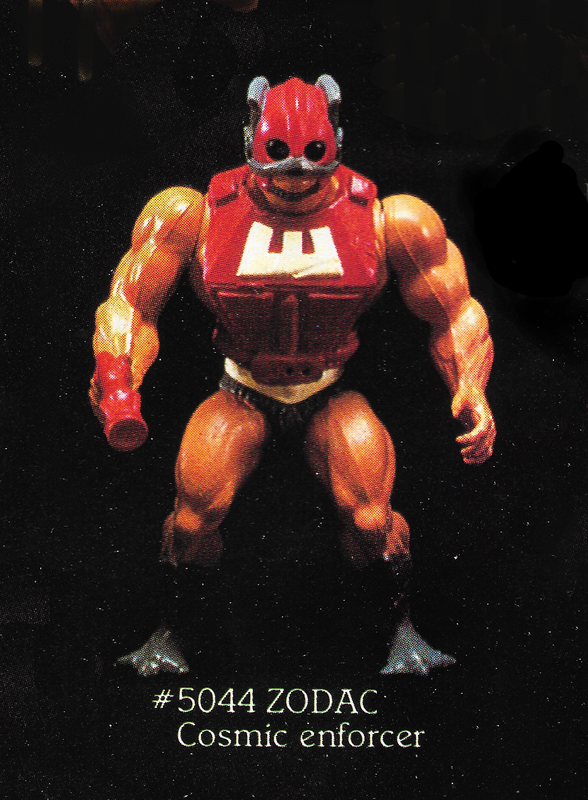 When Faker was released in 1983, he came on the same 8-back card as the original 8 figures. 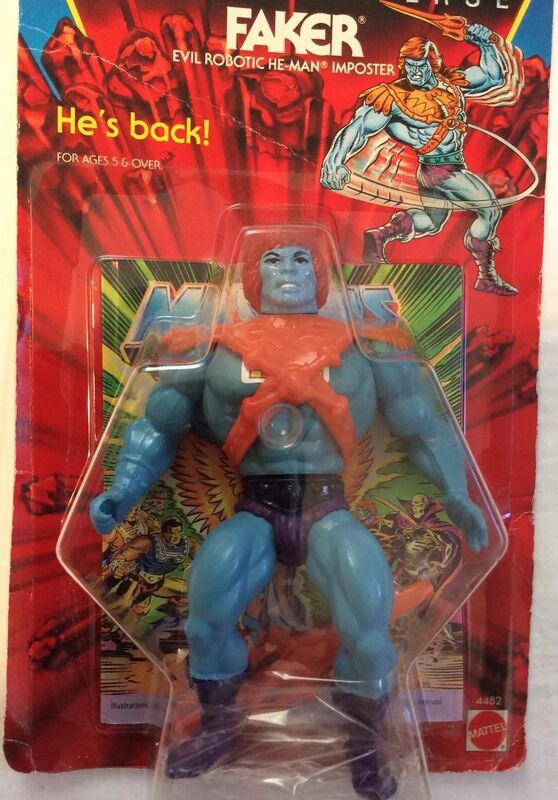 He must have been released in relatively low quantities, as a carded example is tough to come by now. 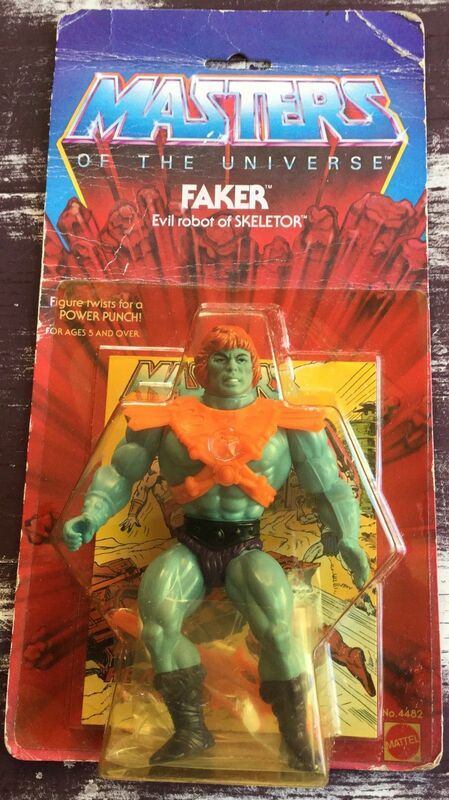 A rare variant of Faker (made in Taiwan) came with Skeletor’s arms. 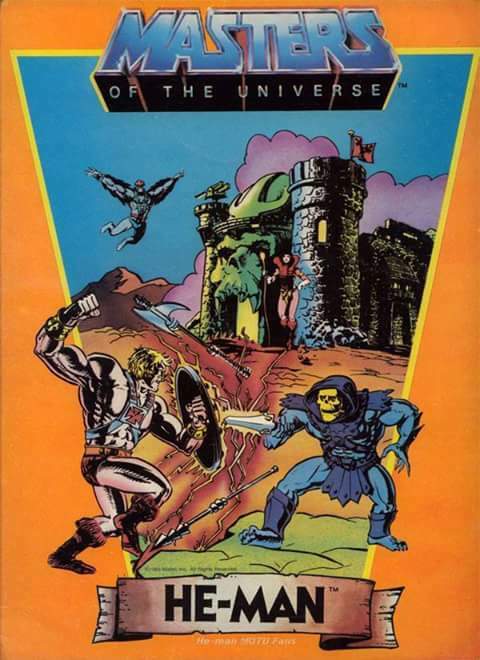 This particular version is from 1983, but includes the updated cardback with artwork by Errol McCarthy. 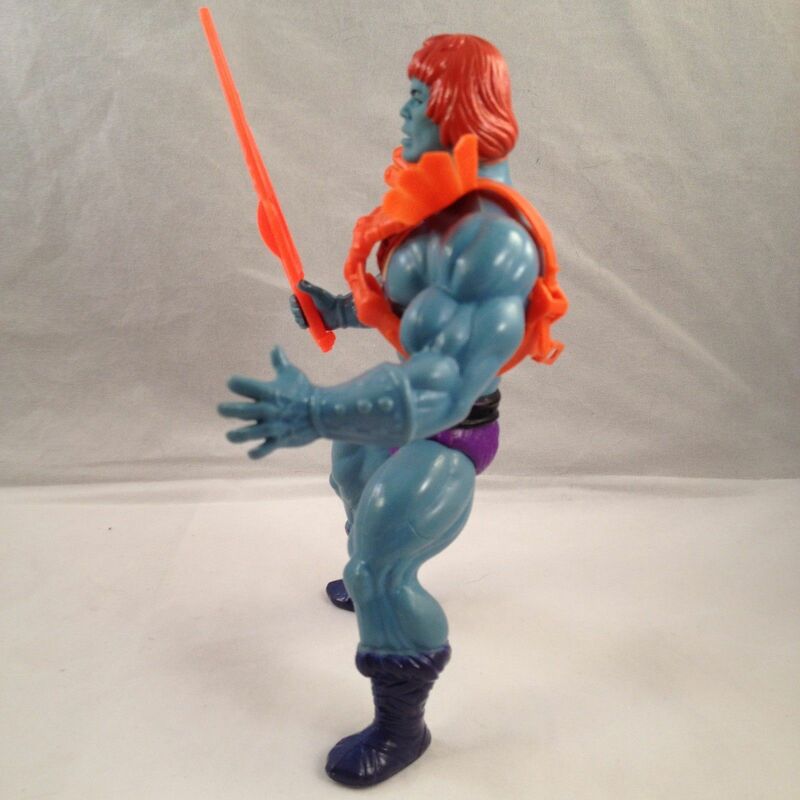 Unless the figure is carded, it’s really impossible to tell if the figure’s arms were swapped with Skeletors, making it a variant that really only has value if it is carded. For more discussion on that topic, see this thread. 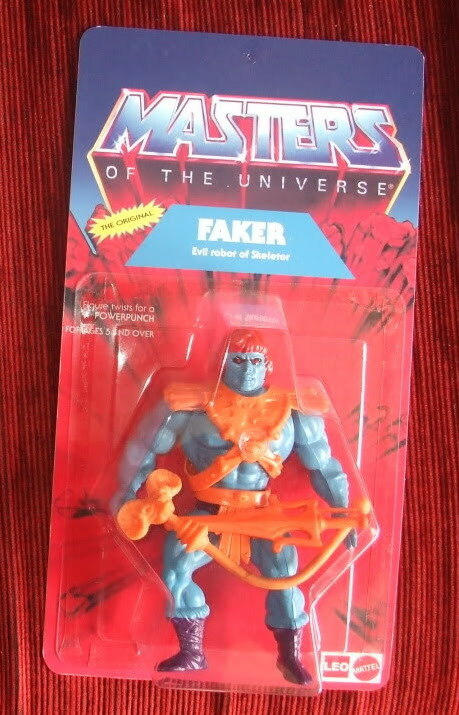 Faker was also unusual in that he got a re-release in 1987 after having been discontinued for years. 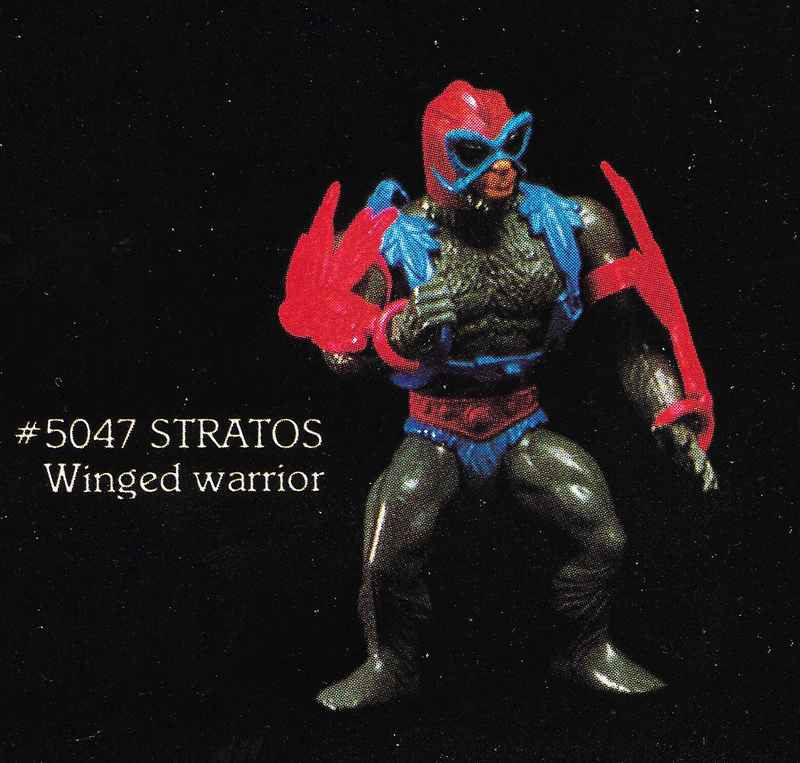 The line was struggling at the time, and most new figures were heavily reusing old parts. 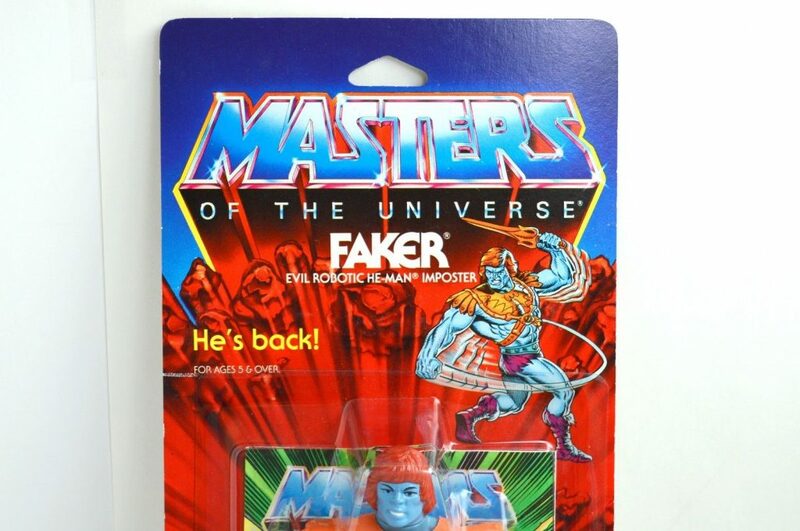 It must have seemed a good time to bring Faker out of retirement. Faker starred in his own commercial. 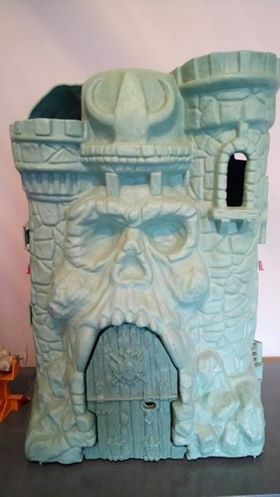 Apparently this was produced in 1982. 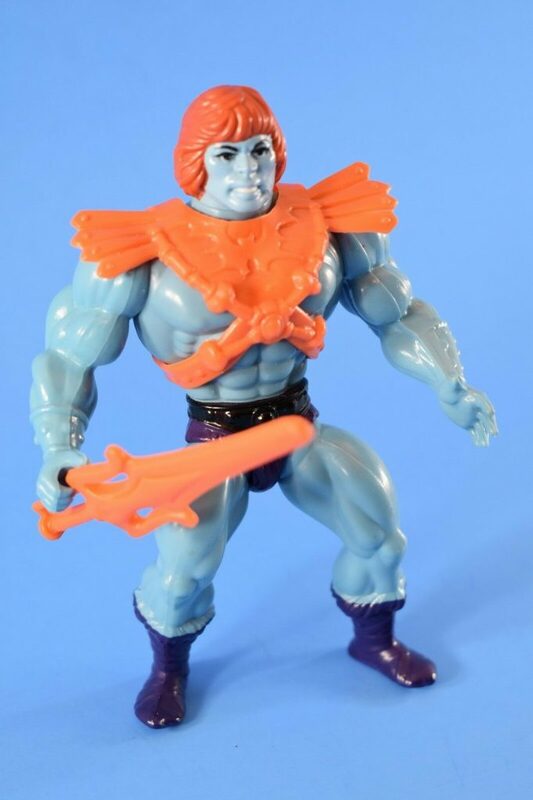 Could the figure have been released in 1982? Possibly, but if so, very late in the year. 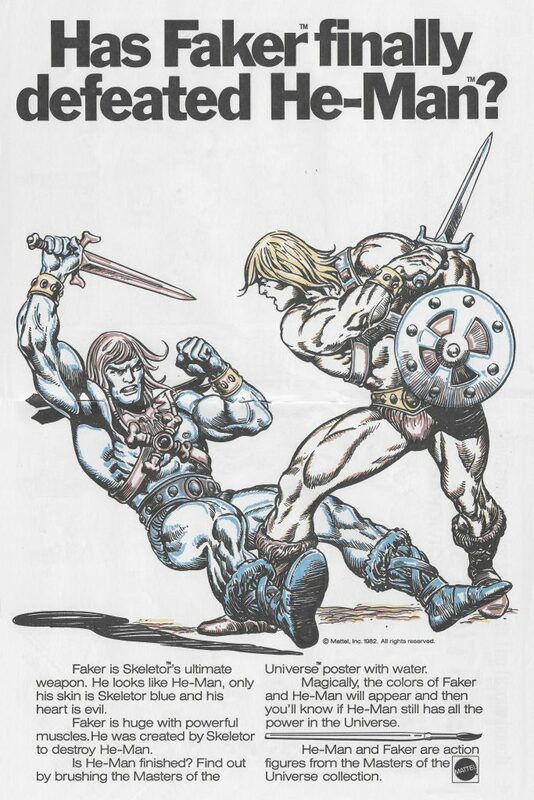 From the Golden Giant Picture Book coloring book (Evil Warriors version), illustrated by Fred Carillo. 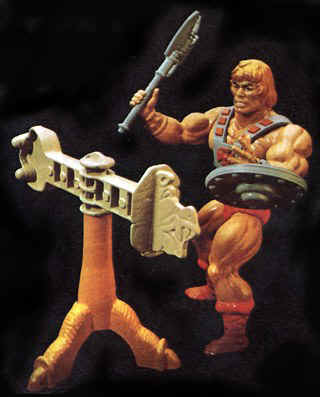 Image via Bustatoons Blog. 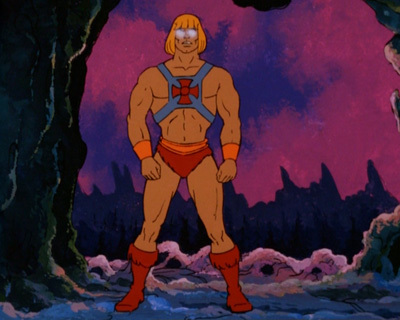 Faker made a single appearance in the Filmation cartoon. 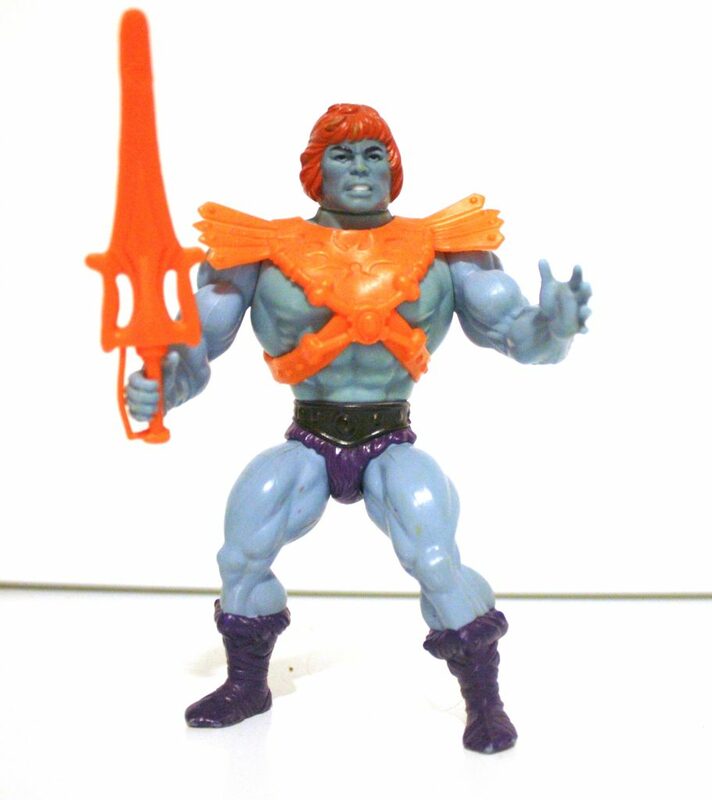 While his design was a bit boring (it’s just He-Man with glowing eyes), it made a lot more sense, plot-wise. 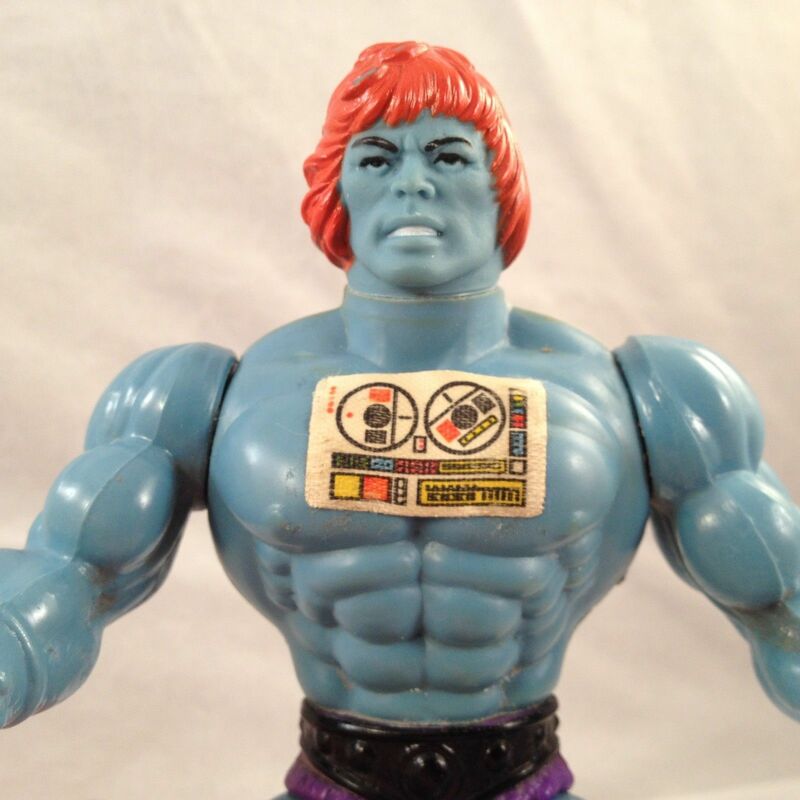 If Faker is supposed to be an evil He-Man impersonator, he would only be effective in that role with the same coloring and clothing as the real McCoy. 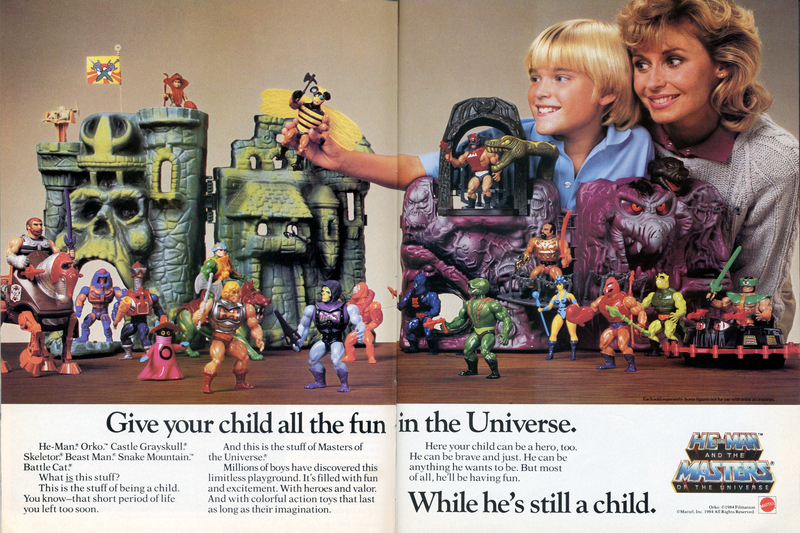 But then, if you wanted something like that as a kid, you would just buy two He-Man figures. I don’t know of many moms who would have gone for that. 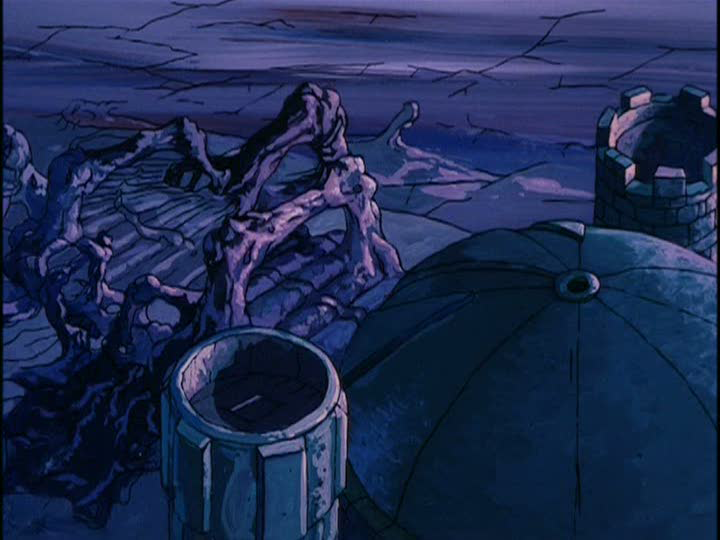 At the end of the episode, He-Man defeats Faker and sends him falling down the bottomless pit near Castle Grayskull. 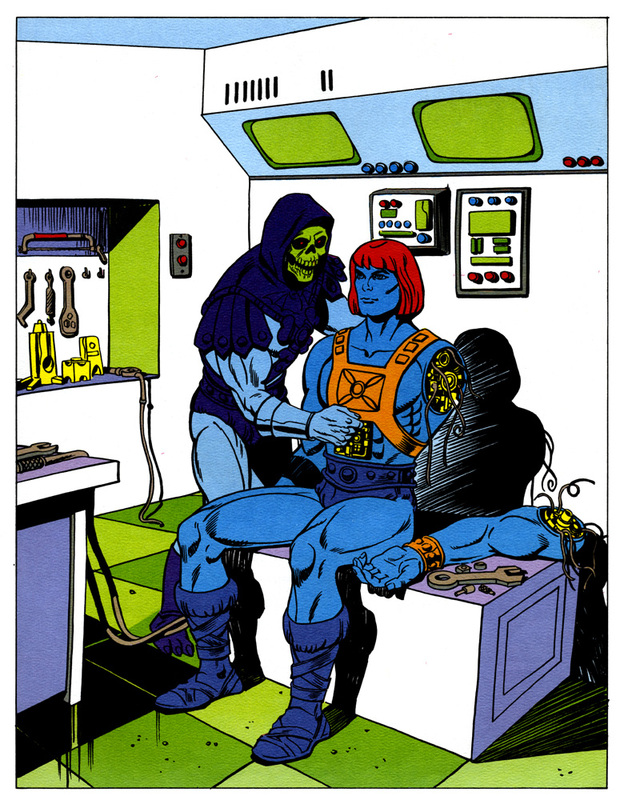 Skeletor makes it known that he plans to restore Faker somehow. 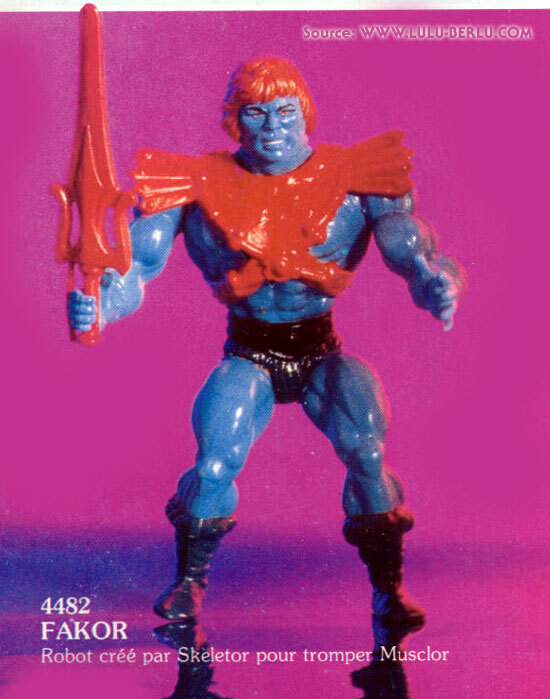 I like to think that either the trip down the hole or the restoration would somehow have left him permanently blue. 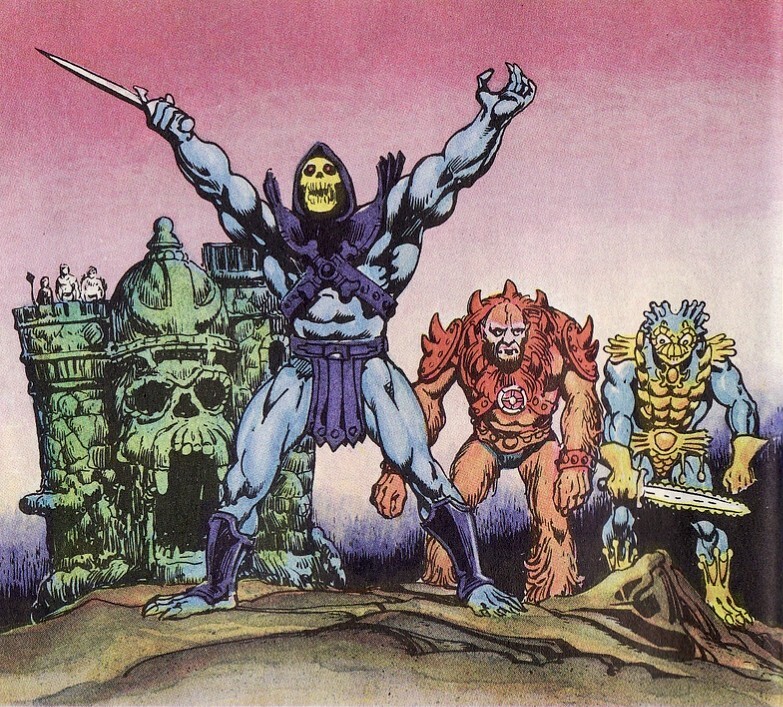 Finally, making up the whole of Skeletor’s evil gang is Faker, a being created by Skeletor himself with the aim of looking exactly like He-Man, to create maximum trouble and confusion. 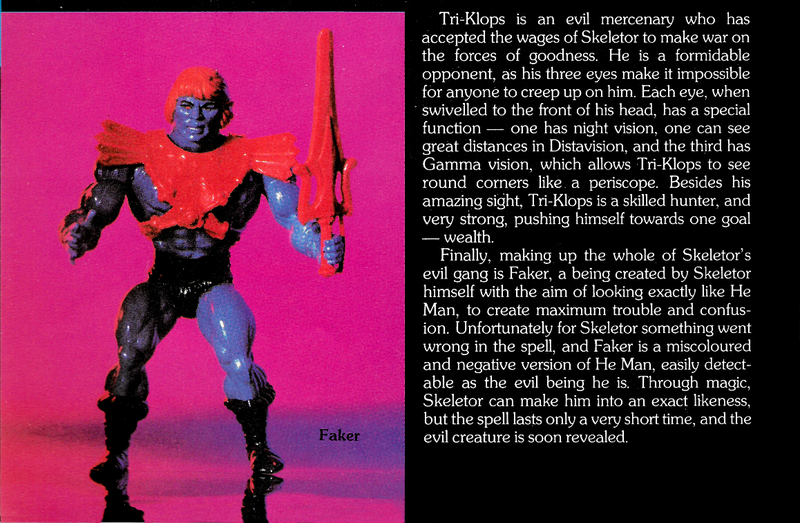 Unfortunately for Skeletor something went wrong in the spell, and Faker is a miscoloured and negative version of He-Man, easily detectable as the evil being he is. 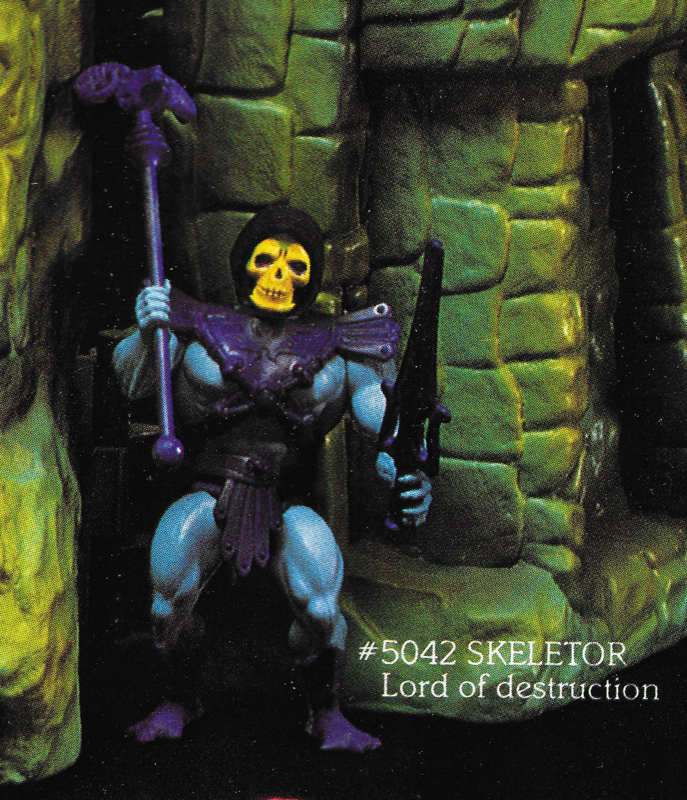 Through magic, Skeletor can make him into an exact likeness, but the spell lasts only a very short time, and the evil creature is soon revealed.